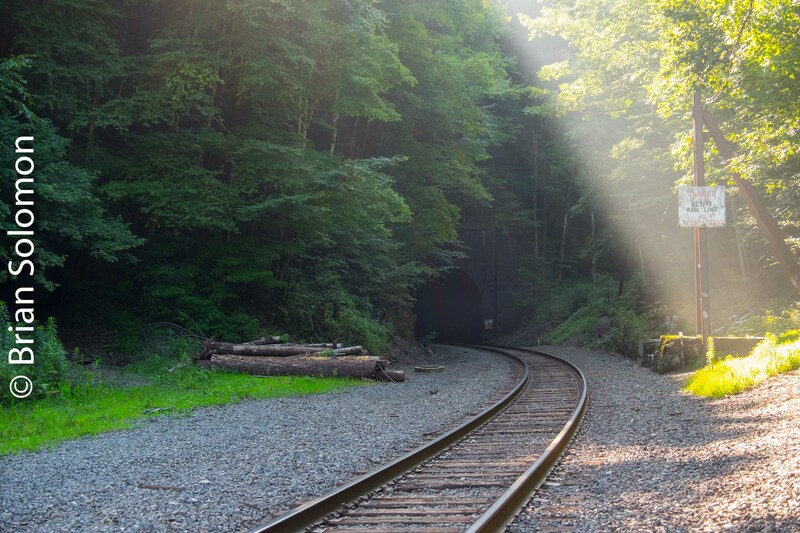 In New England, ordinary people with virtually no knowledge of railroads are aware of ‘The Tunnel’. I’d like to speak with an etymologist, or someone with a deeper understanding of the evolution of New England names. I’ll bet that Hoosick, Housatonic and Hoosac all have the same root, but I’m more curious to know about how and when the variations in spelling originated. But, it’s really the tunnel that interests me; 4.75 miles of inky cool darkness, occupied by legends, stories and ghosts and serving a corridor for trains below the mountain. 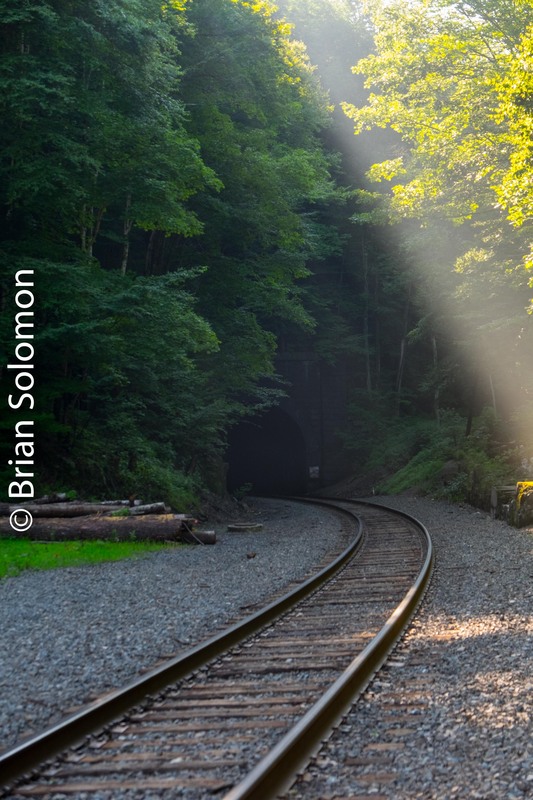 The other day, Mike Gardner and I made a pilgrimage up to New England’s longest tunnel; Boston & Maine’s famous Hoosac. (Please note correct spelling). While waiting for westward freight EDRJ, that was on its way from East Deerfield, I exposed these photos with my FujiFilm XT1. Telephoto view to draw in the East Portal. The portal can’t be too dark, but the shafts of sunlight streaming down can easily be over exposed. As a result, I exposed for the light, than adjusted my RAW files in post processing to make for a more balanced image. This isn’t ‘fixing the photo,’ it’s maximizing the data capture and adjusting it for the most pleasing result. 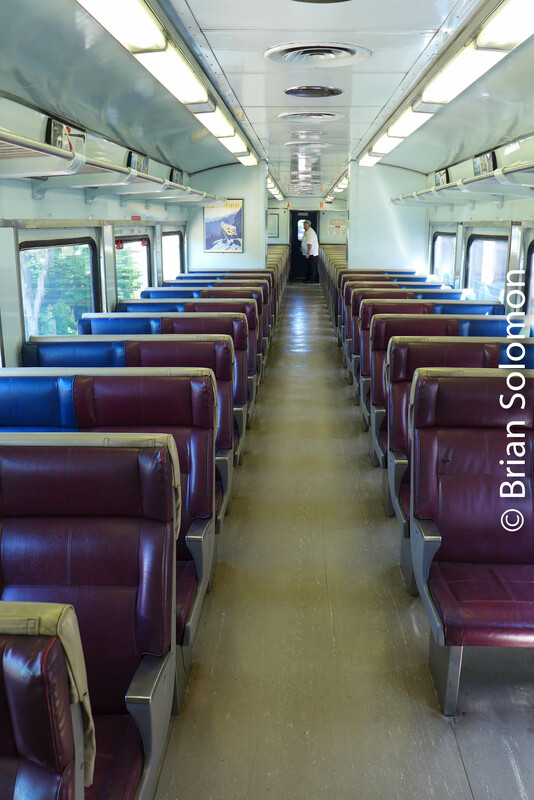 Live from the Lake Shore Limited: Train 449. Just a few views from Amtrak’s Lake Shore Limited westbound. I boarded at Worcester heading west toward Chicago. 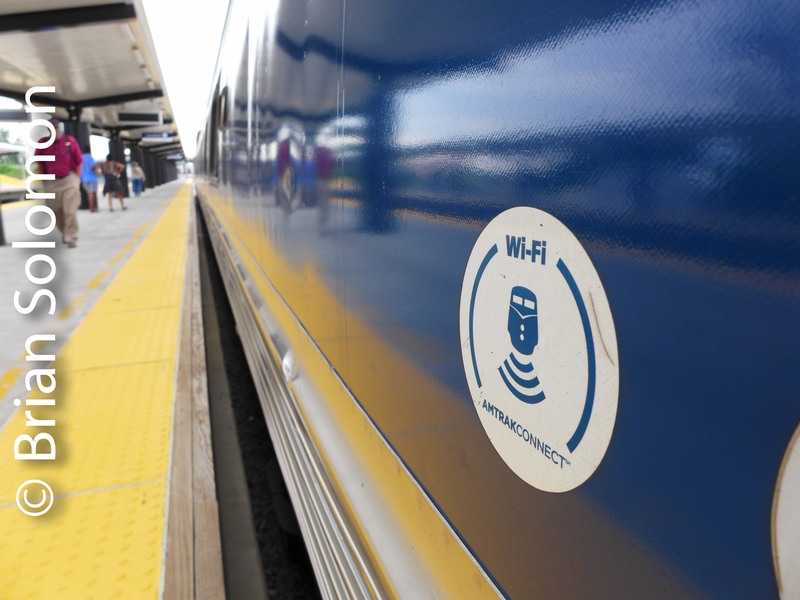 The photos were made with my Lumix LX7, uploaded to my laptop, scaled in Light Room, and then using Amtrak’s WiFi uploaded to Tracking the Light. 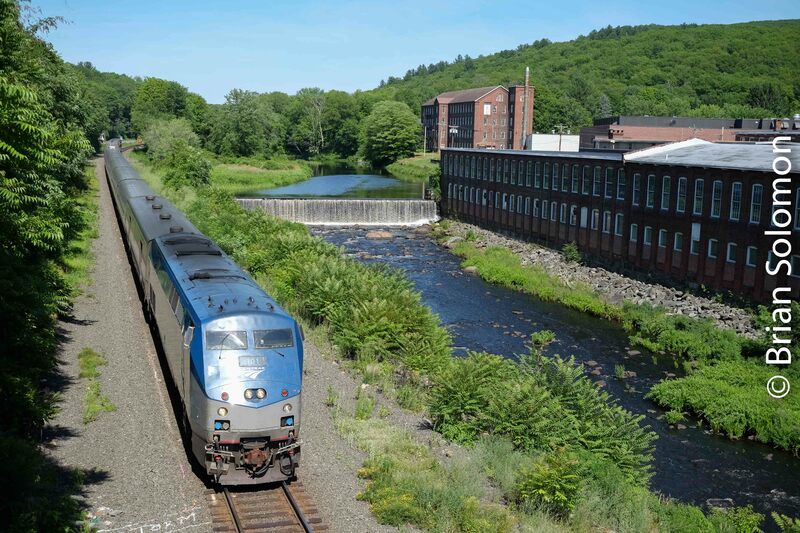 I’d checked my phone; Amtrak 55 had departed Brattleboro, Vermont a few minutes behind the advertised, but was moving southward at a good clip. 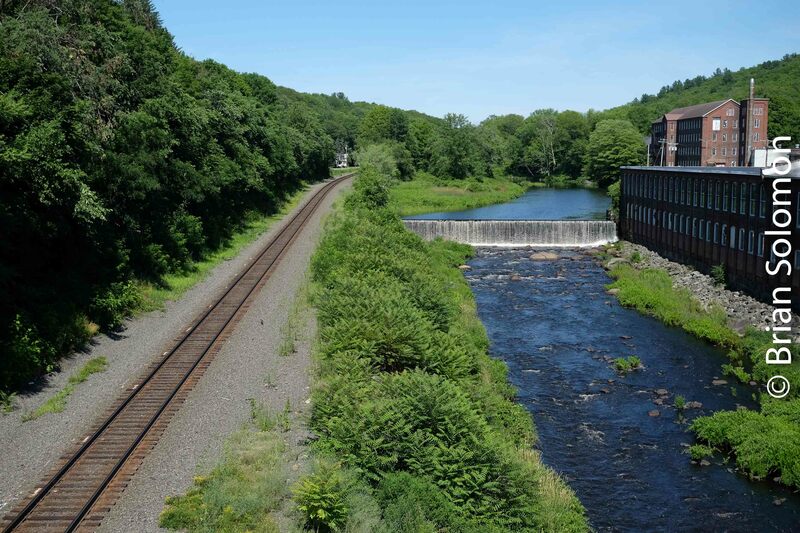 Mike Gardner and I had inspected locations around East Northfield, Massachusetts and settled on the view from an overhead bridge near the ballast pit at Mount Hermon. 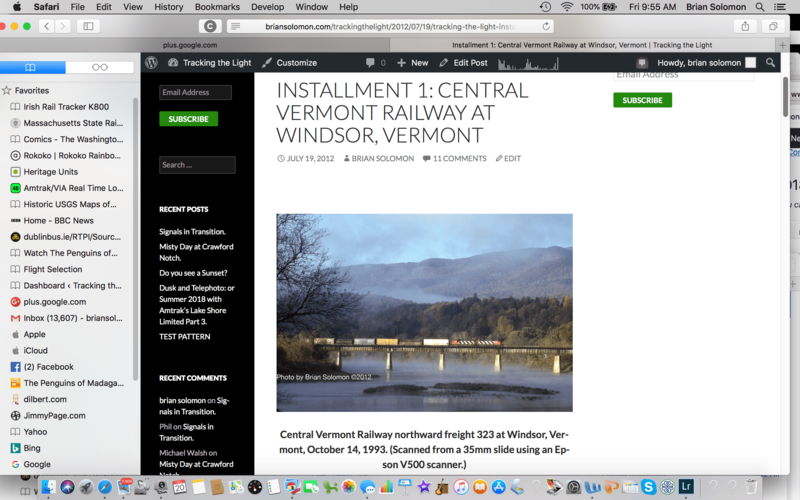 Earlier in the day we’d missed New England Central 611 (yes, this happens!) and so we weren’t taking any chances. In position, camera in hands we were poised and ready for the train. 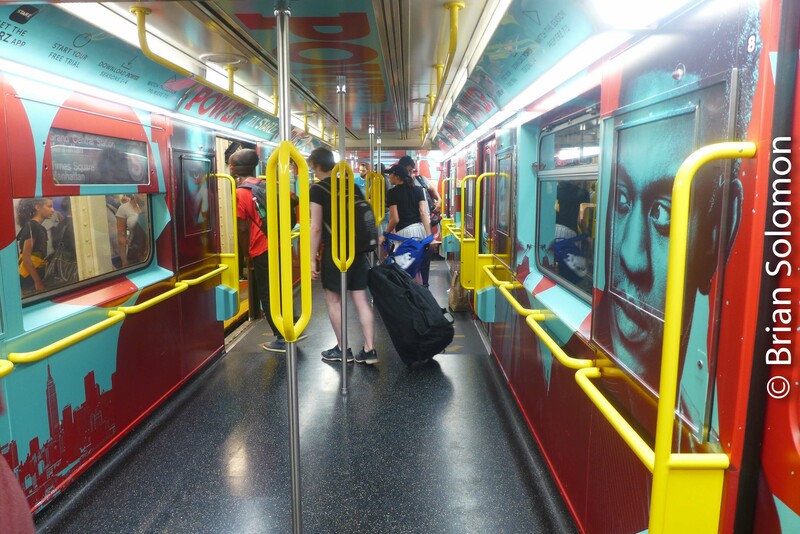 The rain eased, the train came into view, and we exposed our photos. Soft light, mist and condensation, and a lack of harsh reflections from the midday sun (hidden by layers of cloud), contribute to an atmospheric scene. It was worth the dampness! 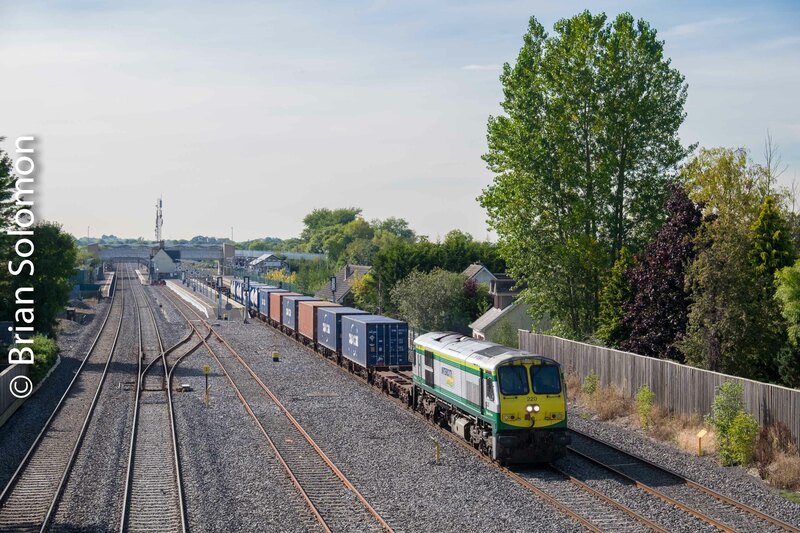 Irish Rail 220; Here and There, North and South, Freight and Passenger, Then and Now. 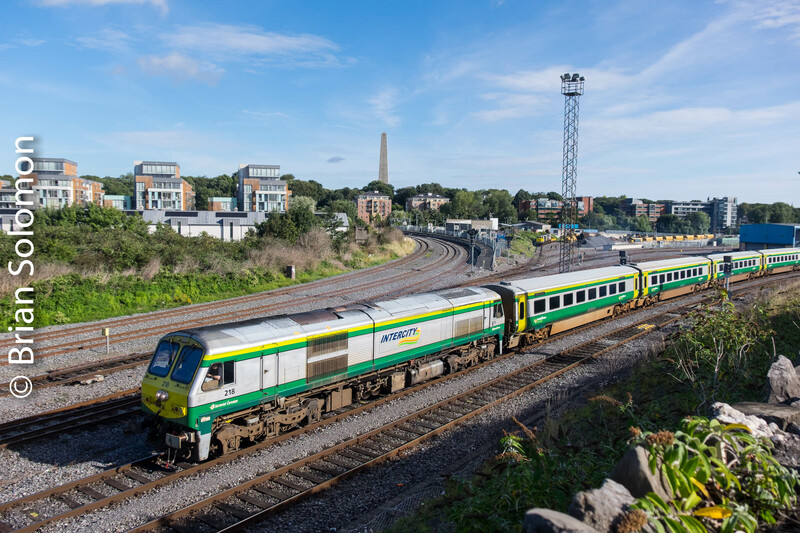 Five views of Irish Rail 220. 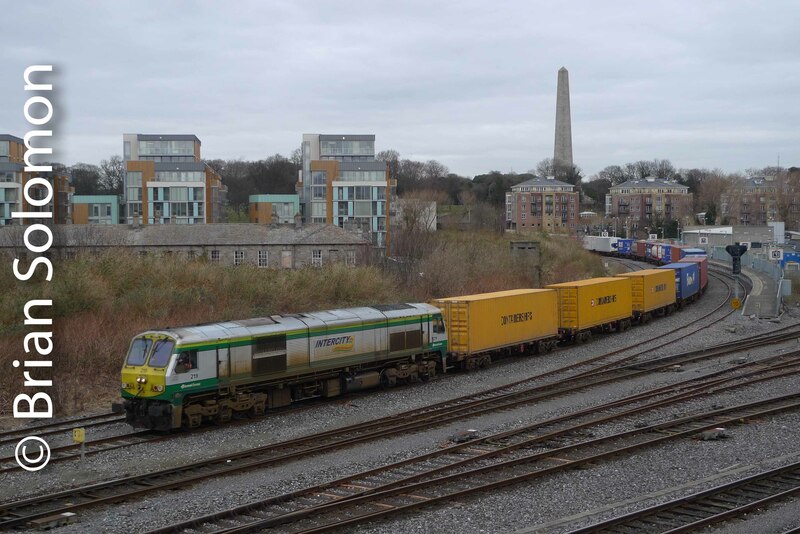 Of the Irish Rail class 201 diesels, number 220 is well represented in my collection! Let’s just say I had lots of photos to pick from, both on film and with digital. 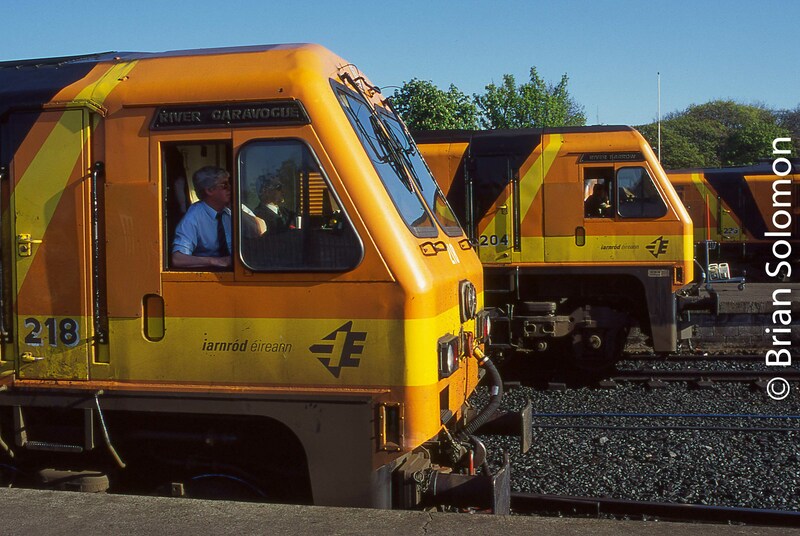 April 2000, I found Irish Rail 220 at Belfast Central. Exposed on Fujichrome Sensia II using a Nikon. 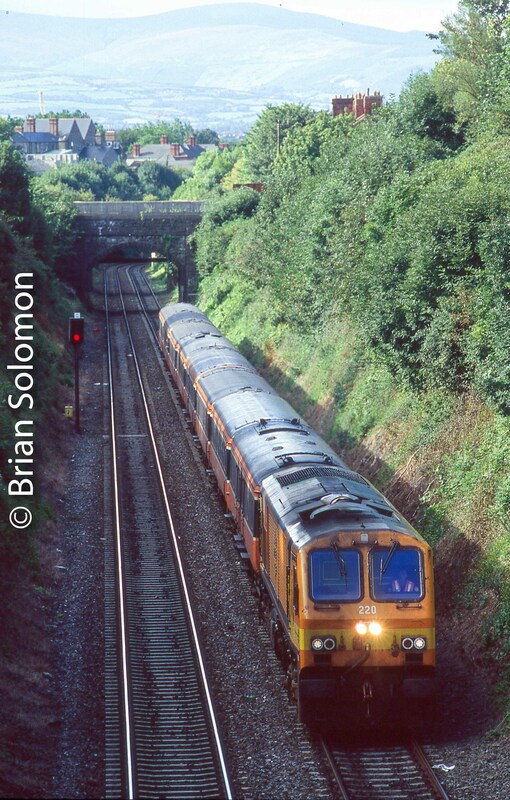 In August 2005, 220 leads Mark 2 carriages toward Connolly Station as viewed from Old Cabra Road in Dublin. The shadowy cut made for a contrasty slide. 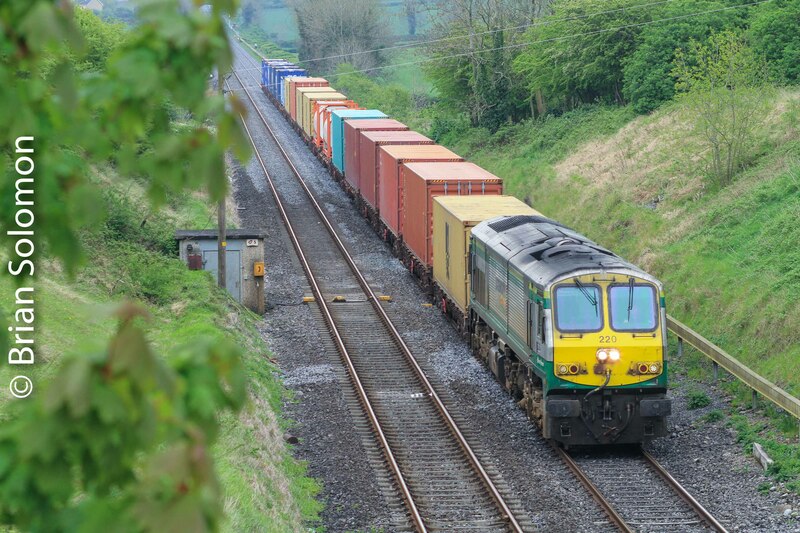 In 2014, I caught 220 working the down IWT Liner west of Kildare from the main road over pass. Exposed using my Canon EOS 7D with telephoto lens. 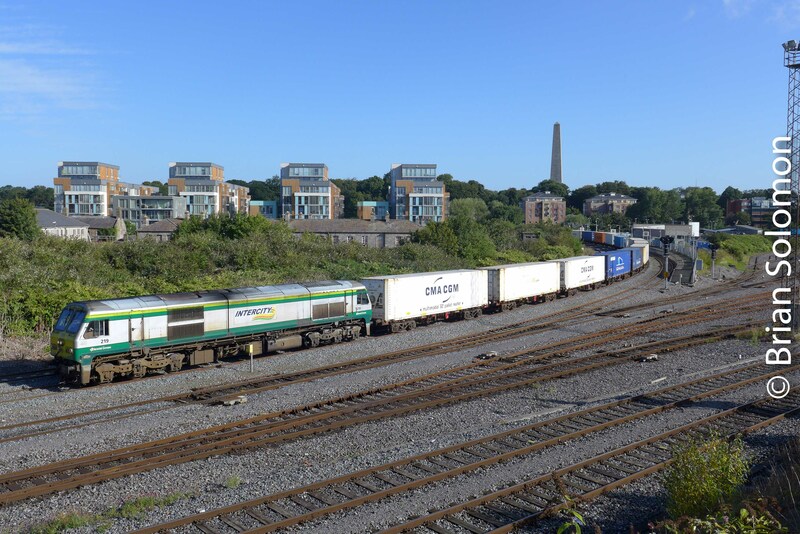 In 2015, I caught 220 working the up-IWT Liner (International Warehousing and Transport container train heading toward Dublin port) passing the station at Hazelhatch on the quad track near suburban Dublin. 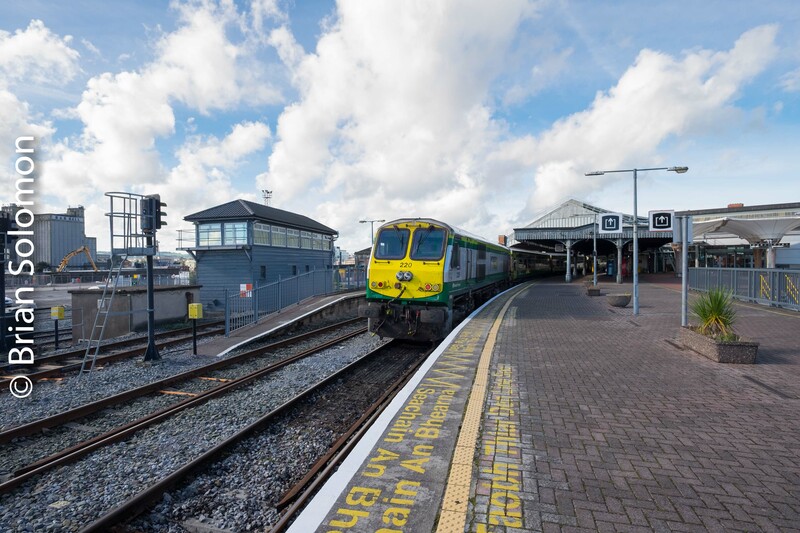 It was a fine October day at Cork’s Kent Station when I exposed this view of 220 with a Mark IV set. In each of the images, I’ve made nominal adjustment to exposure, contrast and colour balance. High Light and Shadows on the Staten Island Railway. 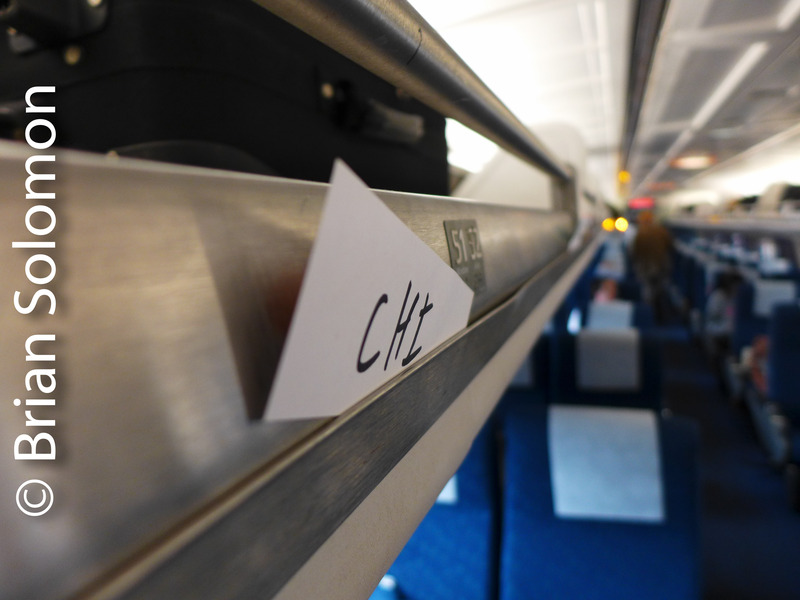 Believe it or not, some of my railway trips are not centered around photography. But I always have a camera. 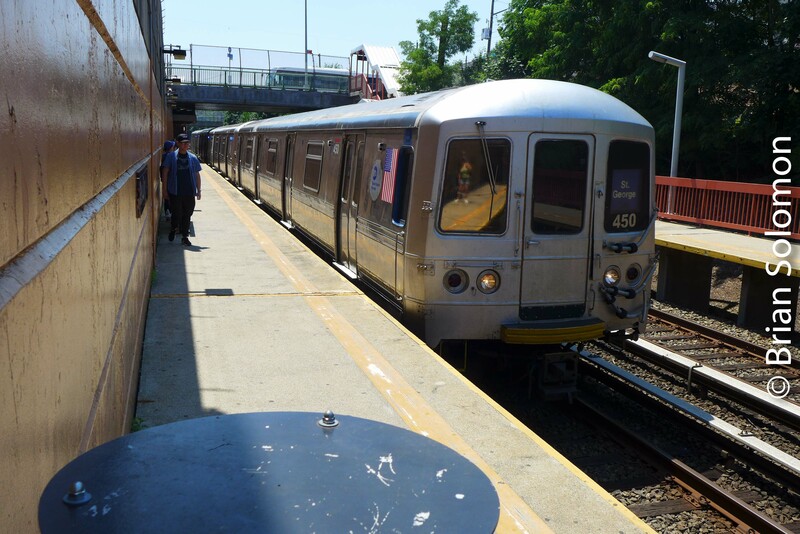 Earlier this month, I revisited the old Staten Island Rapid Transit, today called New York Metropolitan Transport Authority’s Staten Island Railway. 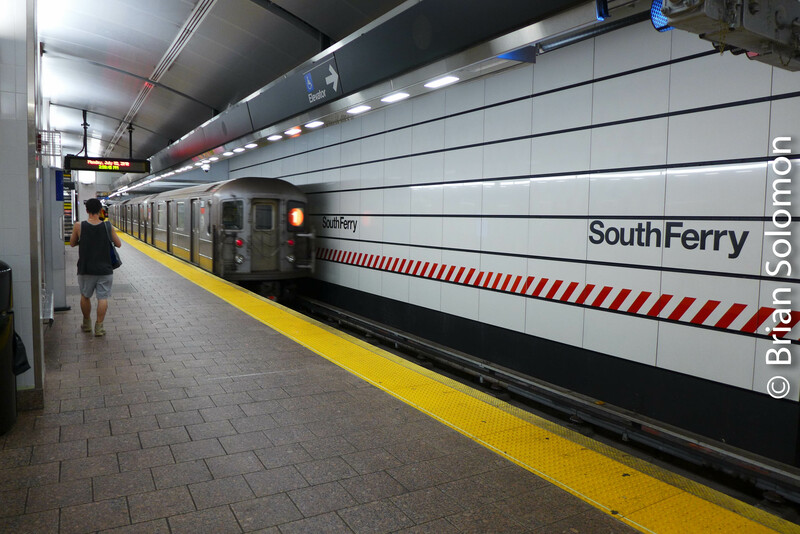 Honer Travers and I had traveled on the famous Staten Island Ferry—the best free ride in New York?—and continued south to New Dorp on the train. Working with my Lumix LX7, I made these photos during our trip, which was during the middle of the day, during the harshest midday summer light. St. George terminal, Staten Island. To help minimize contrast and better hold detail in highlight and shadow areas, I worked with the Lumix RAW files to produce these internet-friendly (scaled) JPGs. The RAW file captures greater amount of information than the camera produced JPG, but it takes some interpretation to make use of it. Not to be confused for ‘trash talk’. 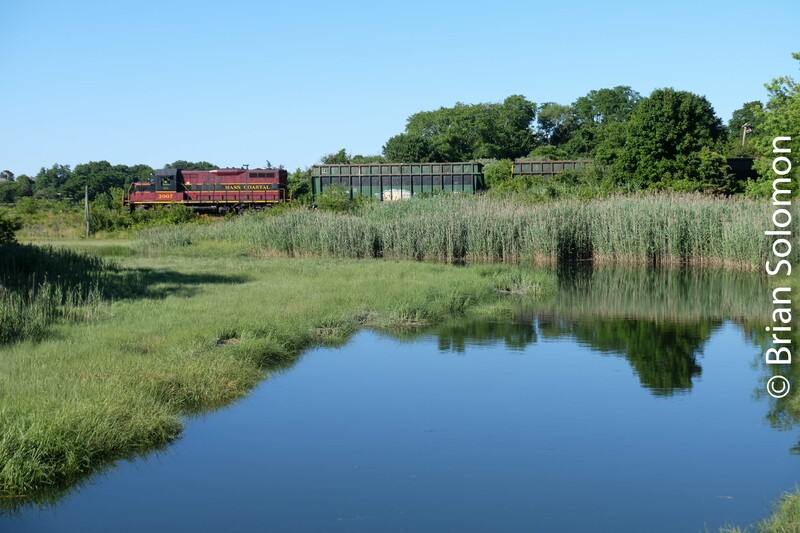 Mass Coastal’s loaded unit trash train crosses a salt marsh at Sandwich, Massachusetts. This was a grab shot. Total set up time: about 7 heartbeats. Zoom lens set at 55mm; exposure f5.6 1/500th second ISO 200. File scaled in Lightroom for internet presentation. Both RAW and JPG files were exposed together, but this image is scaled using the in-camera JPG with a ‘Velvia’ color profile. Have your camera on your lap. Keep it set and ‘ready to go’. Exposed digitally using my FujiFilm XT1 with 18-135mm Fujinon zoom. 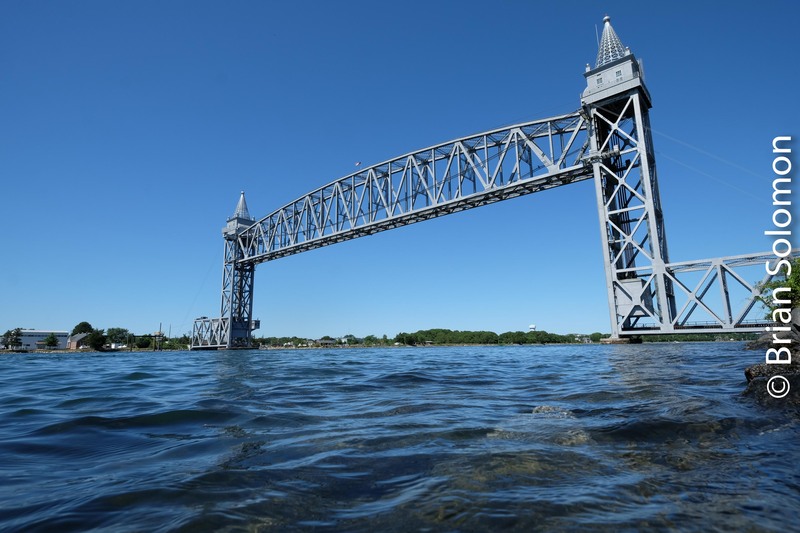 Buzzards Bay Bridge Two Views—Working with a Wide Angle. 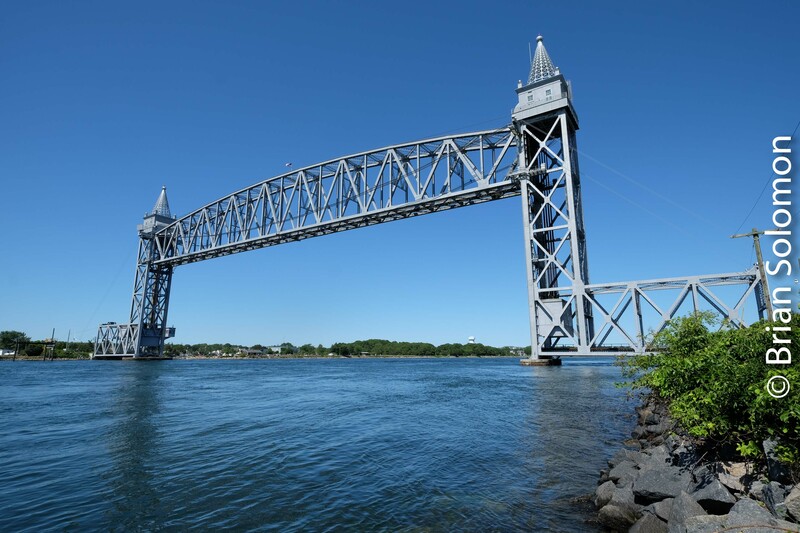 The former New Haven Railroad lift bridge over the Cape Cod Canal is an imposing structure that dwarfs everything around it. I exposed these views using my FujiFilm XT1 with 12mm Zeiss Touit flat field super-wide angle lens. To expose the second image, I extended the XT1’s rear display angling it upward and then looked down to it while holding the camera as close to the water as I dared in order to obtain a more dramatic view. Among the benefits of the XT1’s display system is the built-in level, which I find very helpful when trying to keep the bridge level with the water. Using the level with the rear display makes it much easier to make these close to the water photos. Back in the old days, I just had to guess! 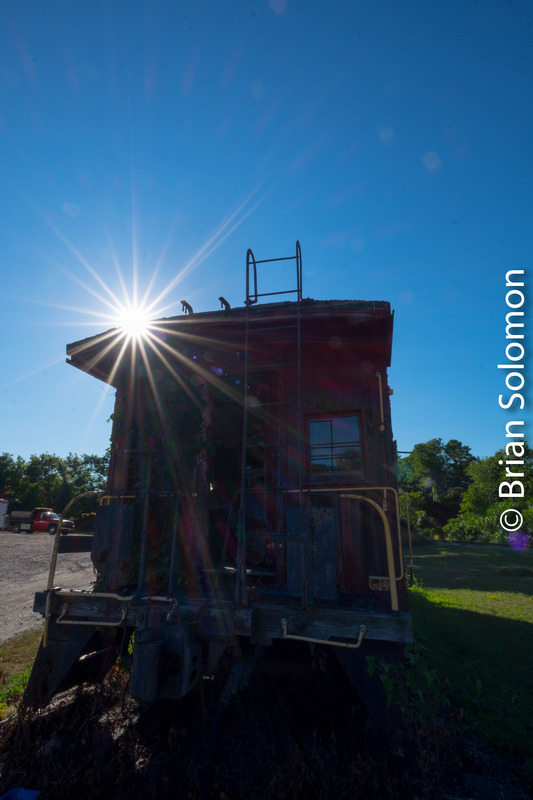 I made these trailing views of Cape Cod Central’s Dinner Train at Sagamore, Massachusetts in the final minutes of direct sun. 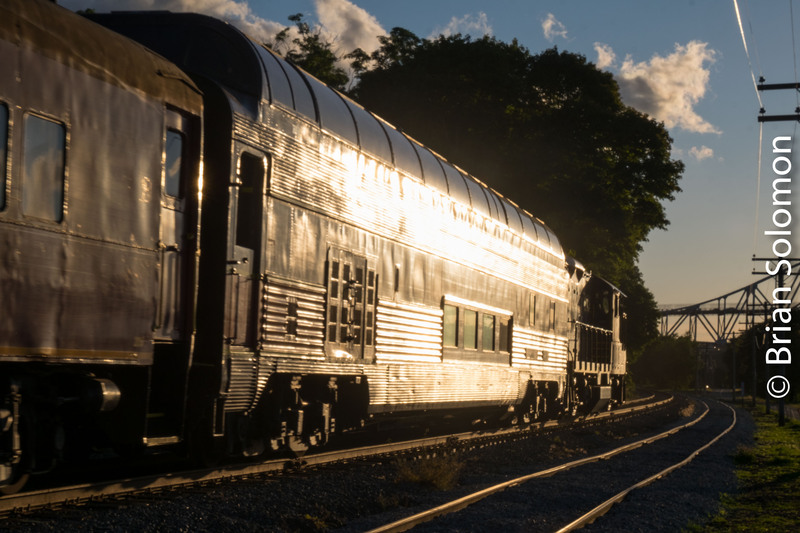 The broad open channel of the Cape Cod Canal adjacent to the railroad plus an open area with minimal shadowing caused by line-side brush and structures made for an ideal place to capture the low-evening sun reflected off the classic passenger cars. I exposed a burst of photos with my Fujifilm XT1 digital camera with 18-135mm Fujinon zoom set at approximately 50mm. Exposed at f22 1/125th second at ISO 200. Camera RAW file adjusted in Lightroom to control contrast and maximize highlight detail with slight balancing/lightening of shadows. Next frame in the sequence. Exposed at f22 1/125th second at ISO 200. This is the camera produced JPG with Velvia color profile, and except for scaling for internet was without post-processing altering or adjustment. Exposed at f22 1/125thsecond at ISO 200. Raw file adjusted in Lightroom to control contrast and maximize highlight detail with slight balancing/lightening of shadows. Nature and the Old Caboose. 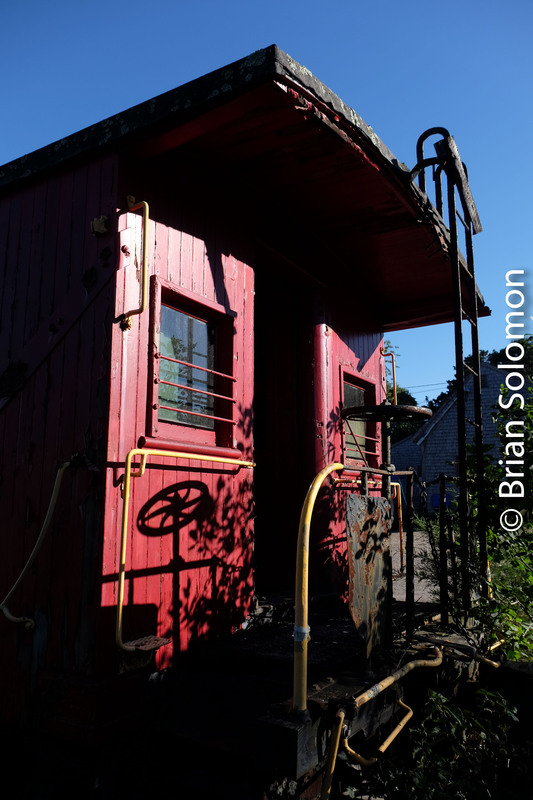 This old wooden body Delaware & Hudson caboose is on display at West Barnstable, Massachusetts. The decaying wood, peeling paint, combined with encroaching foliage and low evening sun made for some fascinating studies. 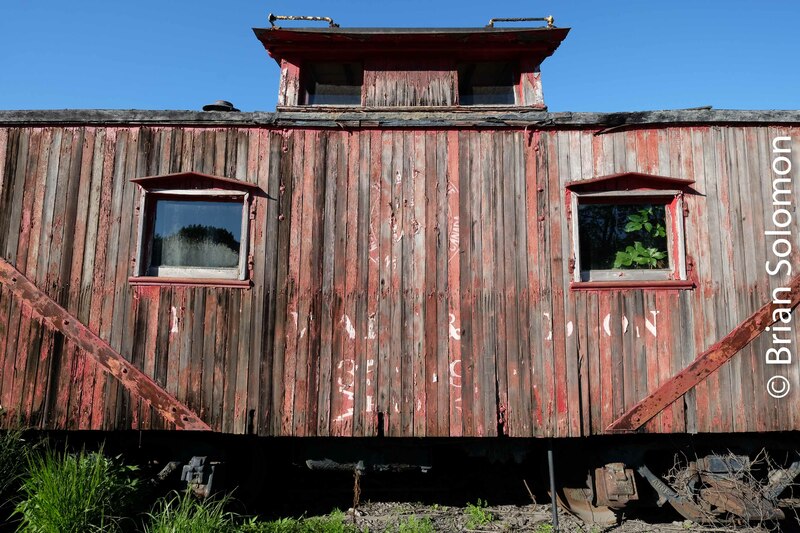 Now relics of an earlier era, cabooses were once standard equipment at the back of North American freight trains. FujiFilm XT1 with a 18-135mm Fujinon. Exposed for light areas at the end of the caboose. FujiFilm XT1 with a 18-135mm lens. FujiFilm XT1 with 18-135mm lens. FujiFilm XT1 with a Zeiss 12mm Touit lens. FujiFilm XT1 with a Zeiss 12mm Touit lens. Aperture set at f22 (minimum opening) to give the sun a ‘star burst’ effect. File adjusted in post processing to lighten shadow areas. I exposed these photos using my FujiFilm XT1, using a Zeiss 12mm Touit and 18-135mm lenses. (Details in captions). 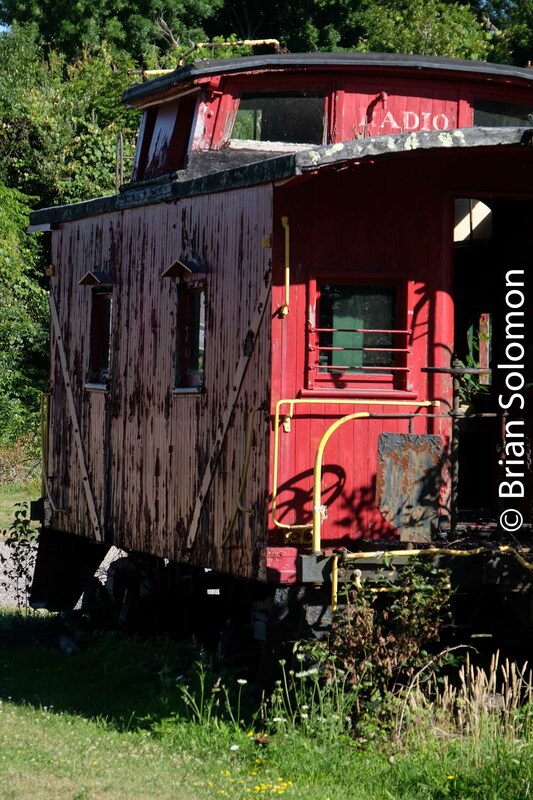 While the decay is what attracted me, I wonder if you think if this same caboose would make for more interesting photos if it was completely restored? Classic Chrome—Portrait view: High-Hood 30 Years Ago Today! At 1133am on July 22, 1988, I exposed this Kodachrome 25 slide east of Norwalk, Ohio. 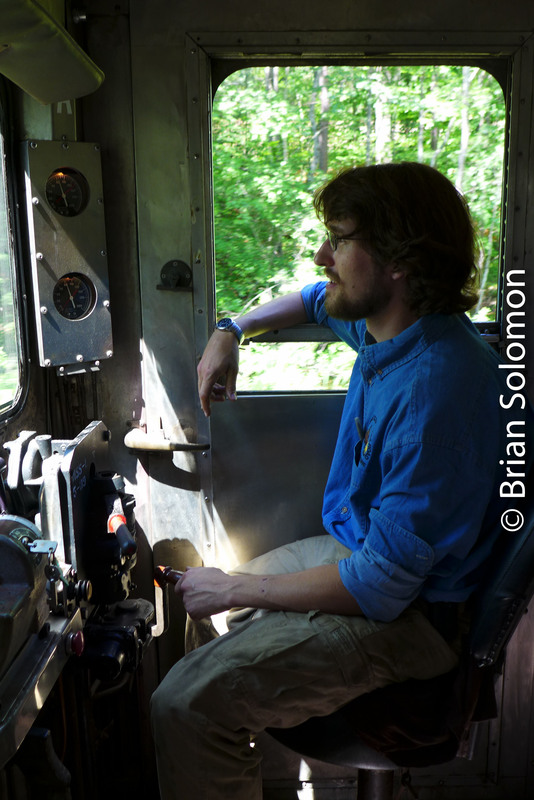 This was part of a big adventure; my old pal TSH and I were spending two weeks on the road photographing trains. We were driving my 1975 Dodge Dart, and had plenty of Kodachrome. (And I had some 120 T-Max 400 for the Rolleiflex too). 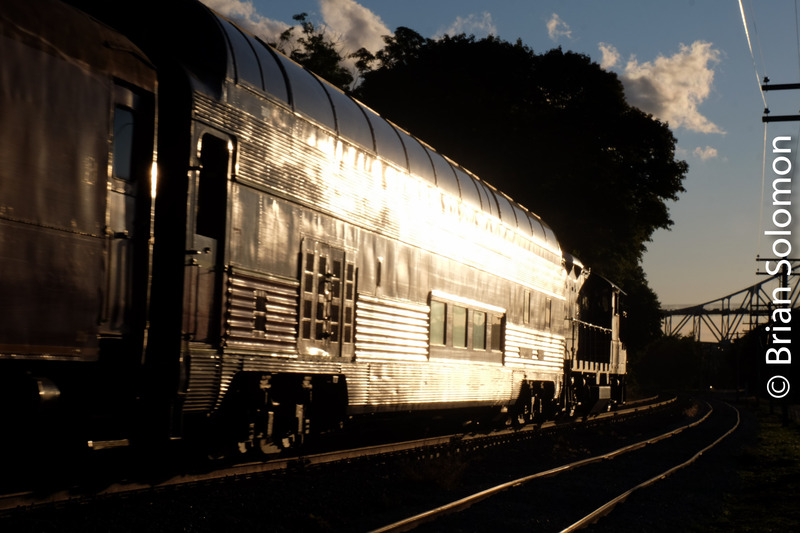 An early morning start on the old B&O west of Fostoria was pure excitement. Several hours later we visited the big yard at Bellevue, Ohio on the old Nickel Plate Road. When we saw this freight departing to the east we made chase. Neither of us has a clue as to where we were going, our maps were inadequate, but we embraced the spirit of the chase and found this overhead bridge. 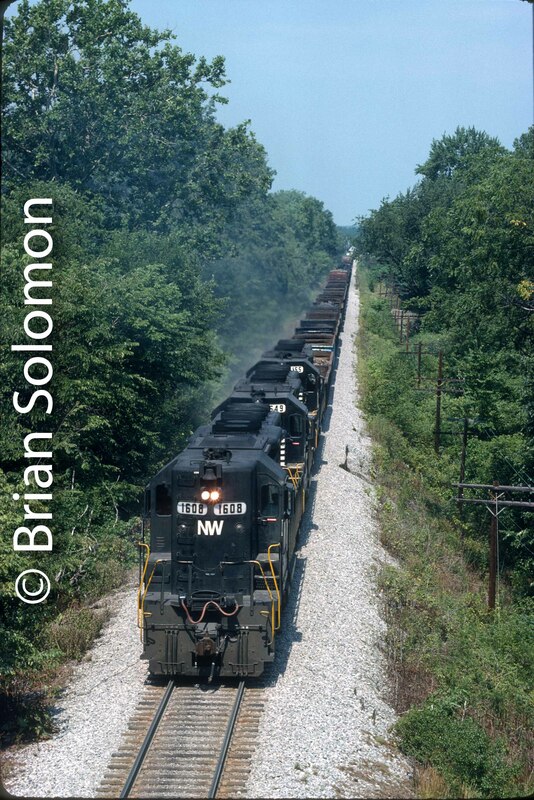 The freight was working the old Wheeling & Lake Erie route and the diesels labored hard in the summer heat. My notes indicate this was Hartland Hill. Click! I made this Kodachrome slide with my Leica M2 with my dad’s 90mm Tele Elmarit; my exposure was f4.5 1/250. The freight was at a crawl and we chased on, catching it several more times before we made a wrong turn and lost track of it near Wellington. I can still feel the thrill of that blind chase 30 years ago today. TSH and I are still pals and we still make trips together. Tracking the Light turned Six on July 19th! On July 19, 2012 I posted the first installment of Tracking the Light. You can view this original post here. Screen shot of the First Tracking the Light installment from July 19, 2012. I spent most of yesterday traveling and making photos and forgot all about this milestone. Tracking the Light should post every day! Over the last few weeks, CSX has been installing new signaling in Palmer in conjunction with preparation for Positive Train Control. Hooded traffic light configuration color-light signal heads have been installed to replace the Conrail-era triangular pattern light signals. 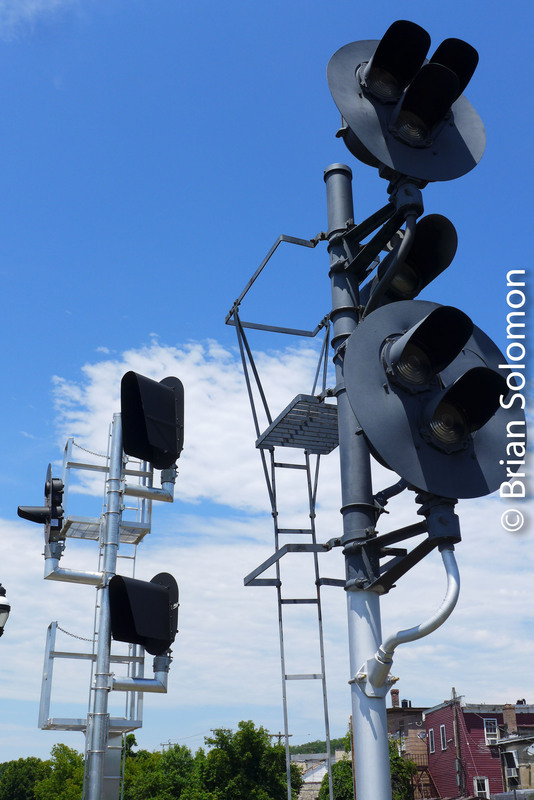 The Conrail-era signals were activated in July 1986 when the single-tracking of the Boston & Albany between Palmer and Springfield. The interlocking at Palmer was then designated CP83. Lumix LX7 photo at Palmer, Massachusetts. Looking north on the New England Central toward the Palmer diamond. New signals at left. Canon EOS7D with 100-400mm lens. 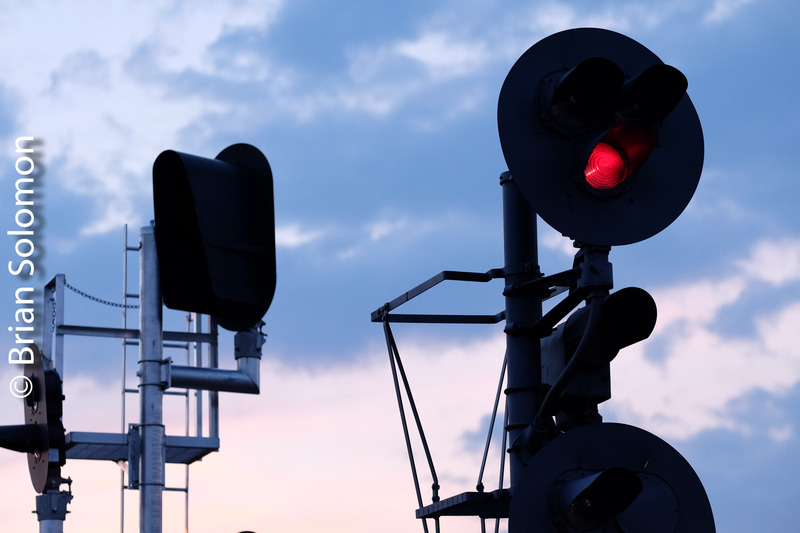 New and old signals at dusk at CP83. FujiFilm XT1 with 90mm lens. 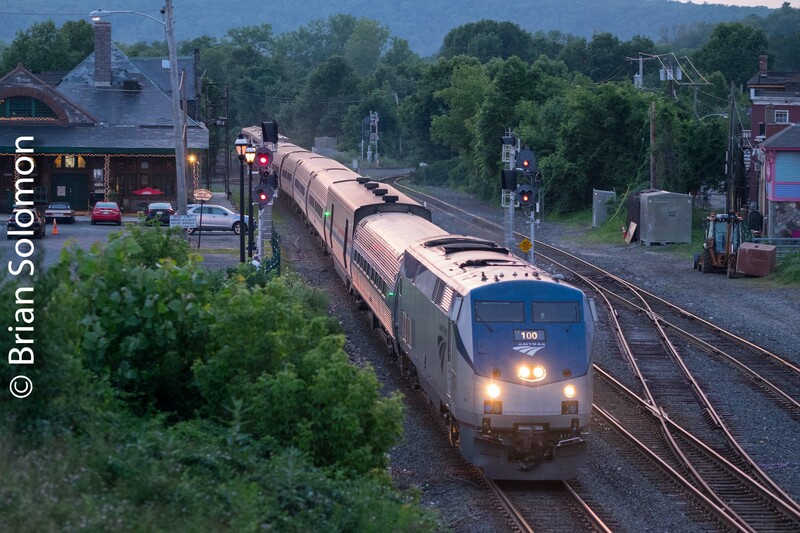 Amtrak 448 splits the signals at CP83 in Palmer. 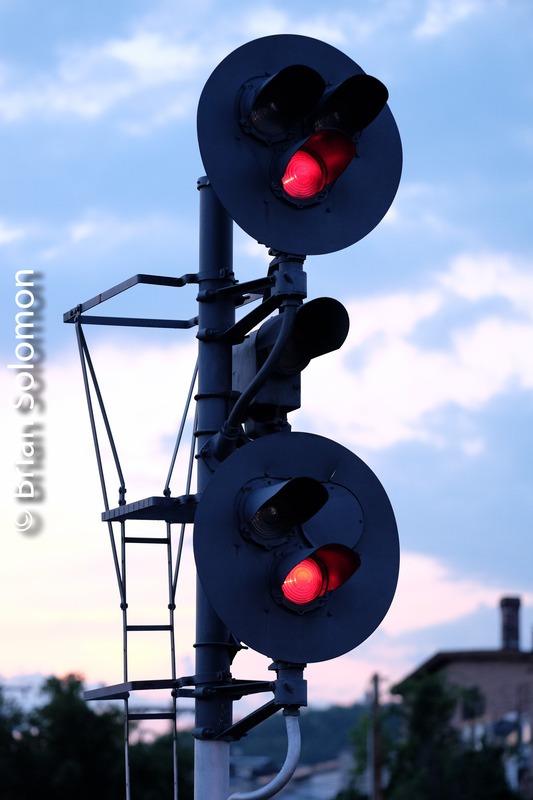 Dusk is a good time to photograph signals since the ambient light levels more closely match those of signal lamps. FujiFilm XT1 photo. 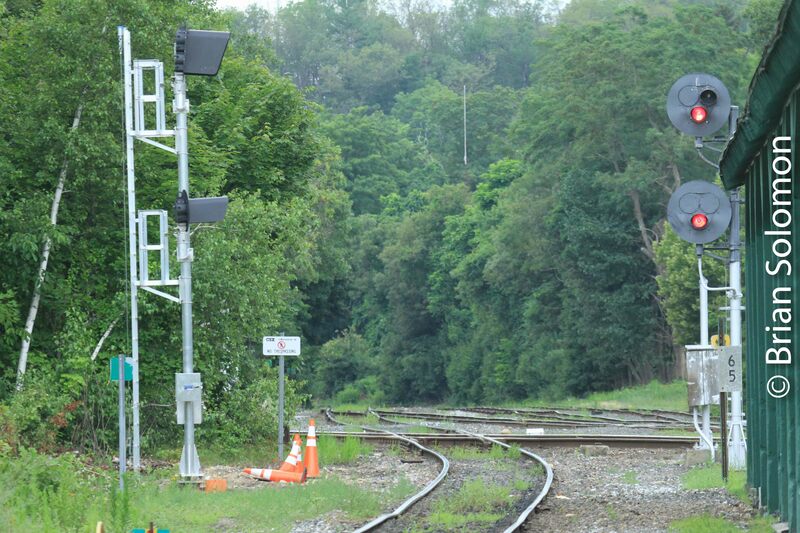 After nearly 32 years of service these old signals will soon be retired. FujiFilm XT1 photo. CSX’s new signals haven’t been activated yet and I’ve been making photos of the transitional between old and new hardware. 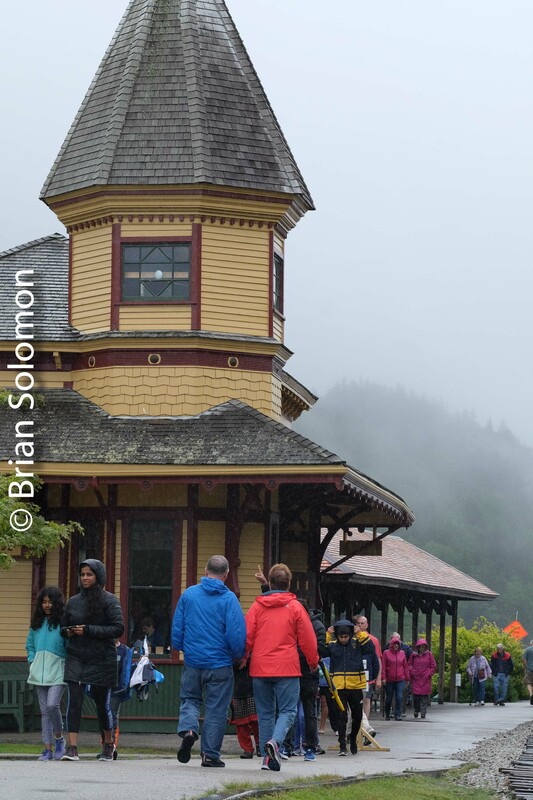 Misty Day at Crawford Notch. It’s not often that I visit New Hampshire’s Crawford Notch. 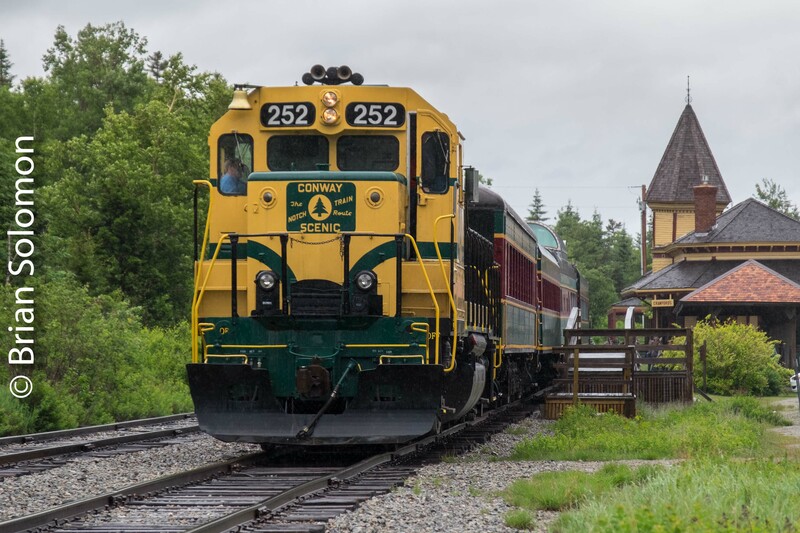 Last month, Honer Travers and I made the journey from North Conway up the fabled Maine Central Mountain Division on the Conway Scenic Railroad. 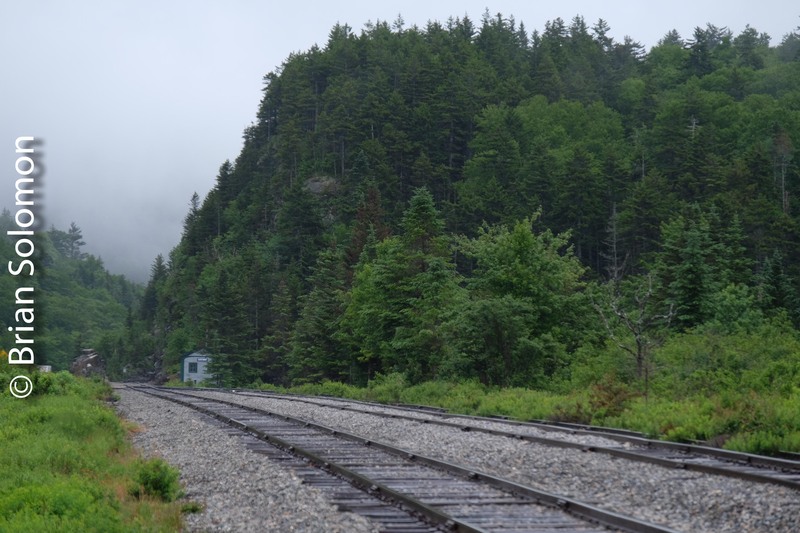 It rained most of the way up, but this is such a wonderful stretch of railroad we didn’t mind. It was nice to see the old Maine Central in person again. At the Notch I made these digital photos using my FujiFilm X-T1 and Lumix LX7 digital cameras. Not every photo can be made on a sunny day. Looking east toward North Conway and Portland. FujiFilm X-T1 photo. There’s that old Maine Central 252! Hey, I remember that beast. I caught it at Mechanicville, NY on a B&M freight way way back in 1984! Do you see a Sunset? Over the last few days many viewers (myself included) have experienced problems with Tracking the Light posts. The reasons for these difficulties were both beyond my understanding and my control. I’m sorry if this has caused you a problem. As of this morning, the difficulty appears to have been resolved. As a test, below I’ve inserted two versions of photo . If both do not appear on your screen/device there is still a problem. So, do you see a sunset? If not, there remains a serious fault in the system I’ve used to present Tracking the Light. Smaller and unmodified version of the above image. I’m reminded that the internet is still a work in progress and doesn’t always perform as hoped. Thanks to Eric Rosenthal, Richard Solomon, and everyone who offered assistance yesterday. 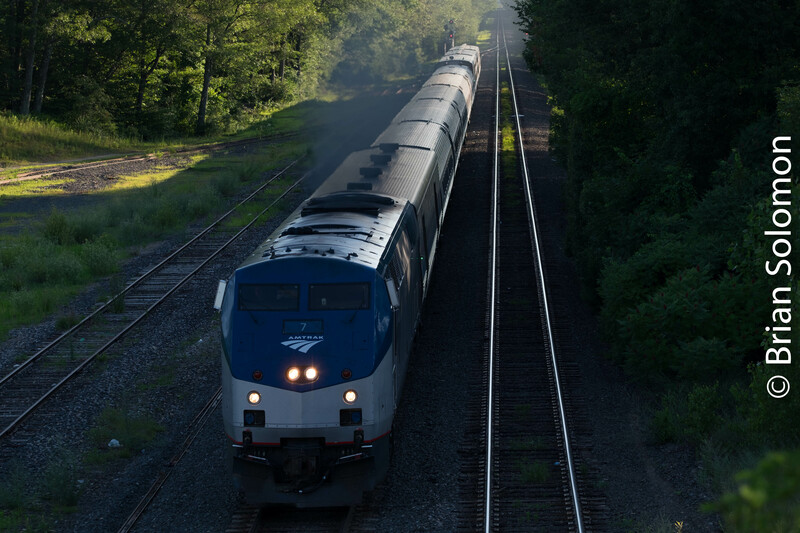 Dusk and Telephoto: or Summer 2018 with Amtrak’s Lake Shore Limited Part 3. NOTE: This post originally appeared on July 17, 2018, but owing to unknown technical faults the photos would not display properly. There should be four images displayed below with captions. Tracking the Light is about process and not every photograph is a stunning success. 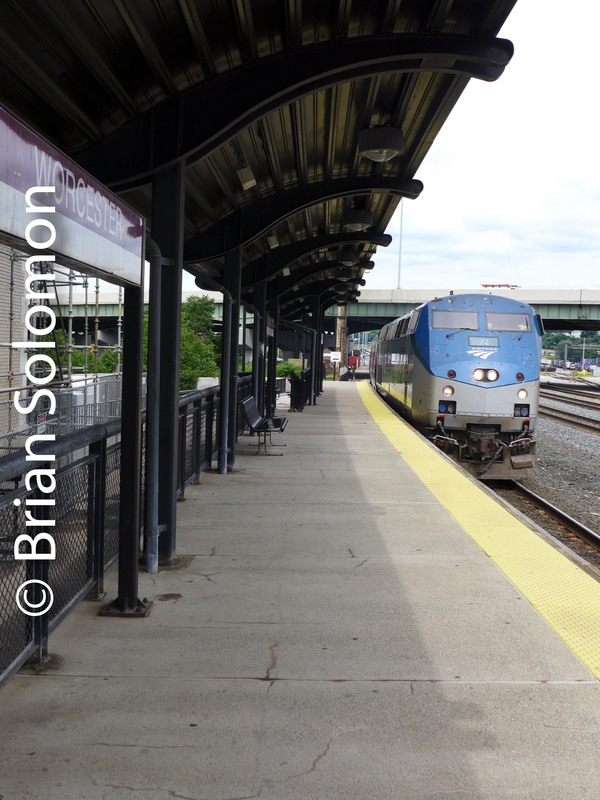 This post is part of my on going series of exercises photographing Amtrak’s Boston Section of the Lake Shore Limited that is running with extra sleepers as result of the temporary suspension of the New York section owing to Penn-Station repair. 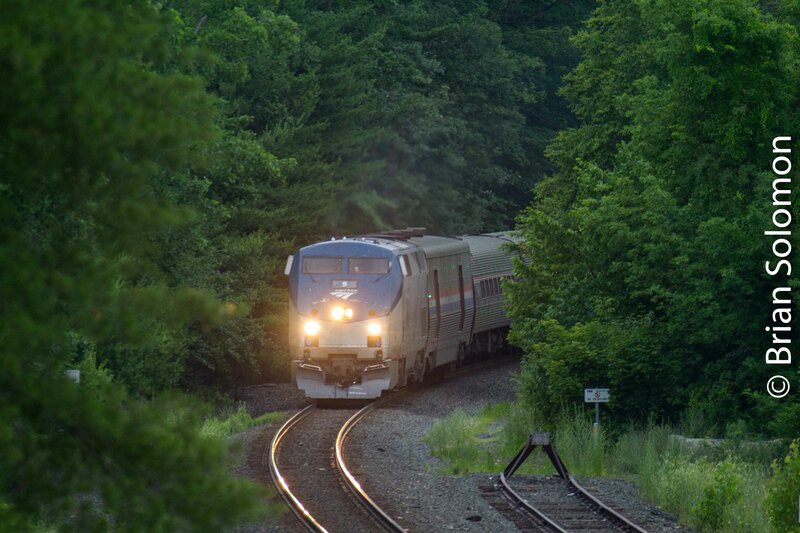 Last week, my father and I drove to West Warren, Massachusetts, this time to photograph the eastward train, Amtrak 448. The benefit of West Warren is the relatively open view with identifiable features. 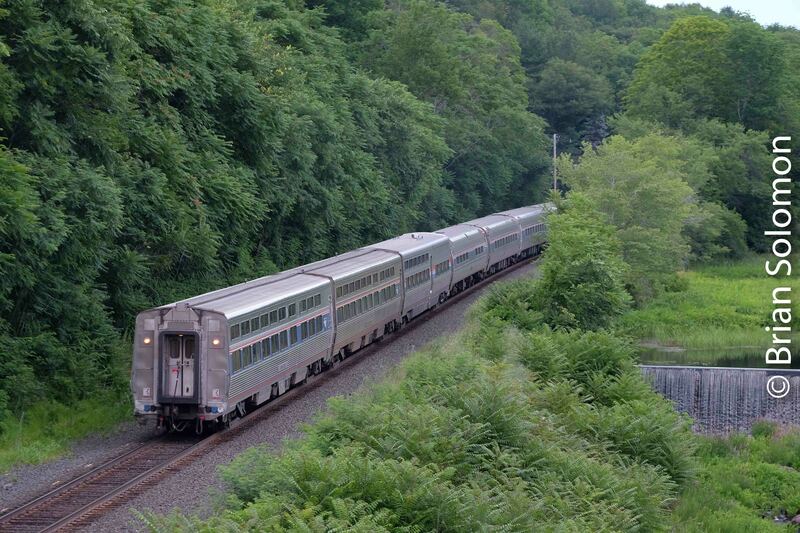 As mentioned previously, summer photography on the Boston & Albany has been made difficult by prolific plant growth along the line that has obscured many locations. In this instance, I worked with two cameras; my old Canon EOS-7D with 100-400mm zoom, and my FujiFilm X-T1 with f2.0 90mm fixed telephoto. Admittedly, the Canon combination isn’t the sharpest set up, but it allows me to play around with a very long telephoto. Exposed at ISO 1250 f5.6 1/125th of a second using a Canon 7D with 100-400 images stabilization zoom lens set at 400mm. This view shows the headend, and the collection of Viewliner sleepers and a diner at the rear of the train, plus B&A milepost 75, but I missed the focus, and overall it suffers from low depth of field and poor sharpness owing to a variety of factors including high ISO and motion blur. Not a calendar contender! The X-T1 is very sharp, especially when working with the fixed (prime) lens. 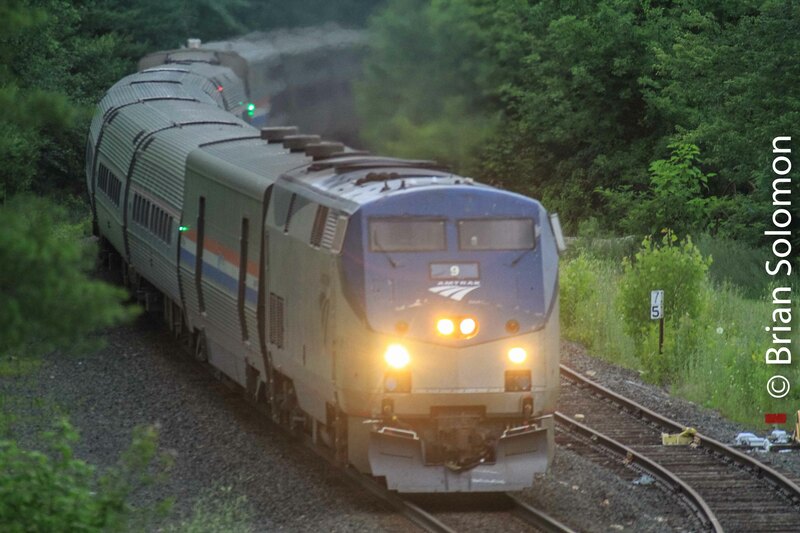 Same train, same evening, same location; shorter, sharper and faster telephoto lens. But is this a better photo? 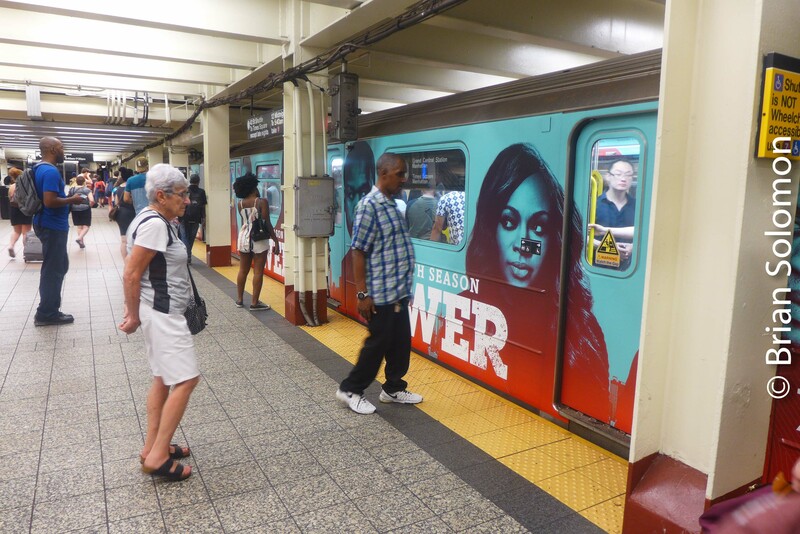 The whole train is shown, but the image prominently features junk in the background. I’m not thrilled about this one either despite better technical quality. Complicating matters was that it clouded over shortly before the train arrived, reduced the amount of available light. Details are in the captions. Trailing view from the same overhead bridge at West Warren. Here a slightly shorter focal length lens may have better suited the scene. The biggest challenge is the overgrowth along the right of way that obscures the curve to the east and clutters the foreground limiting the view of the waterfall and river, etc. Over the last couple of years this location has really grown in. That’s where were are today with Tracking the Light. For reasons beyond my understanding or control the pictures in my posts are not appearing. I’ve done nothing differently. I’m open to suggestions if anyone knows how to correct this fault. The cause of the problem and its solution remain a mystery to me. A related issue is that I can no longer reply to comments. Tracking the Light hopes to post daily! Brian’s Visual Puzzle in THREE photos: Mystery Revealed! Yesterday I received a correct guess to the conundrum I’d posted as Brian’s Visual Puzzle in THREE photos on July 11, 2018. History ( and knowing that history) was key to solving the problem, since the answer wasn’t visible in any of the three photos. To make things a bit more difficult, I didn’t caption the images, however I did offer an array of hints to assist with solving the problem. I had several very thoughtful guesses, some of which were quite interesting. Michael Walsh, a regular Tracking the Light viewer, was the first to submit the correct answer along with his explanation. 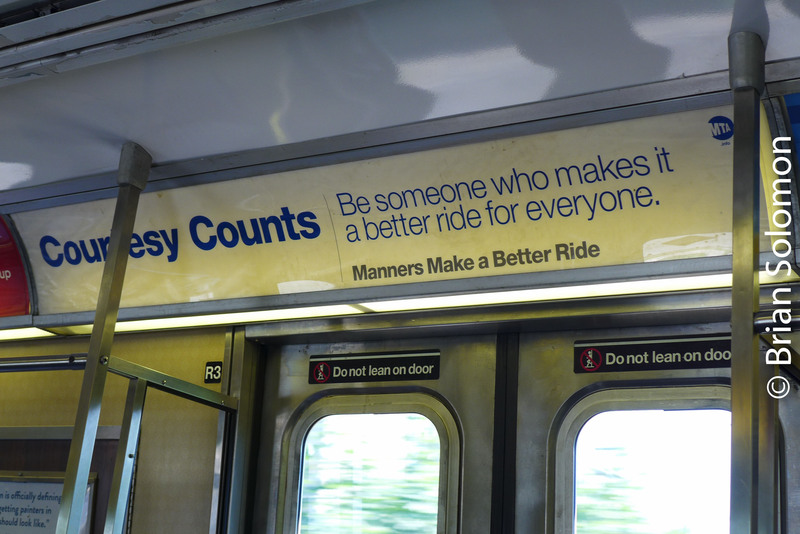 I reckon the theme may be Pan Am Railways. 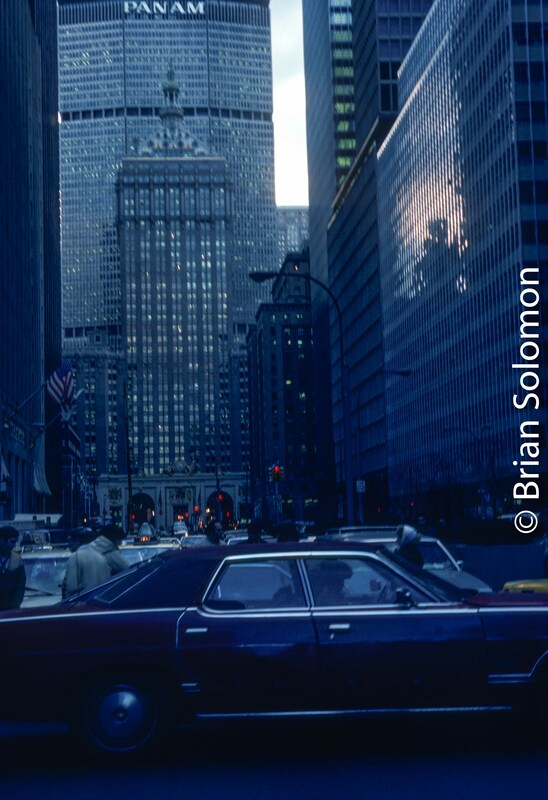 The first picture shows the Pan Am building on Park Avenue in New York, which stands behind Grand Central Station. The name, colours and logo of the defunct Pan American World Airways were purchased by Guilford Rail System in 1998 and applied to their rail New England operations in 2006. 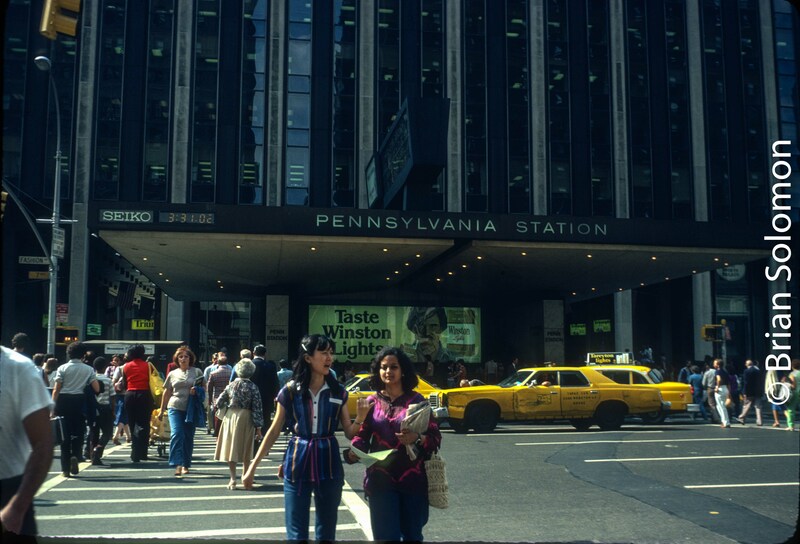 Park Avenue, New York City in December 1982 showing the Pan Am building a top Grand Central Terminal. Pan Am Railways takes its name from the old Airline. The third picture is of exceptional interest. 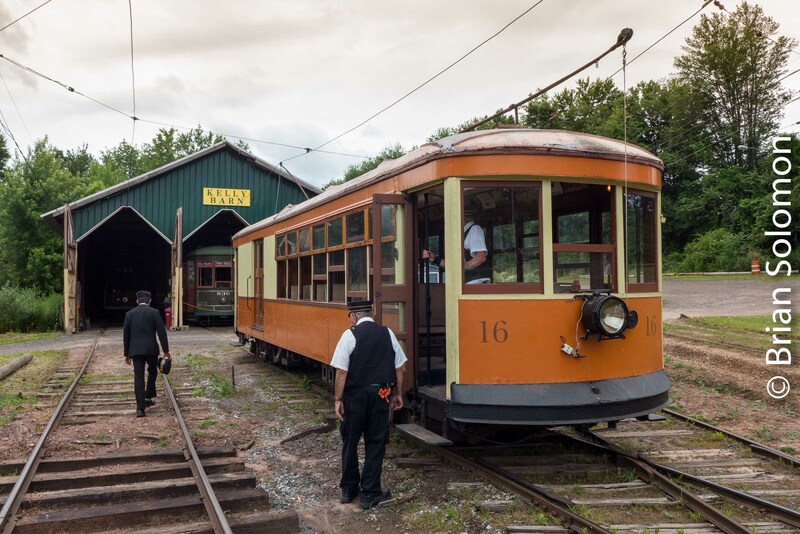 It shows 1926-built combination car 16 of the Springfield Electric Railway, now preserved at the Connecticut Trolley Museum in East Windsor CT. 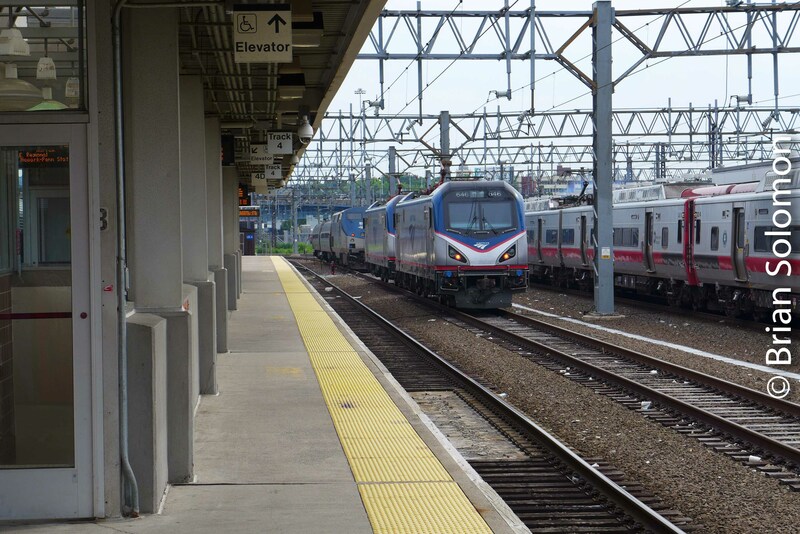 The 6.5 mile long Springfield line became a subsidiary of the Boston and Maine and was later de-electrified. In 1983, it became part of Guilford, along with the B&M. Springfield Terminal number 16 is preserved in Connecticut. Under Guilford Springfield Terminal an important part of operations and many locomotive were letter for Springfield Terminal. 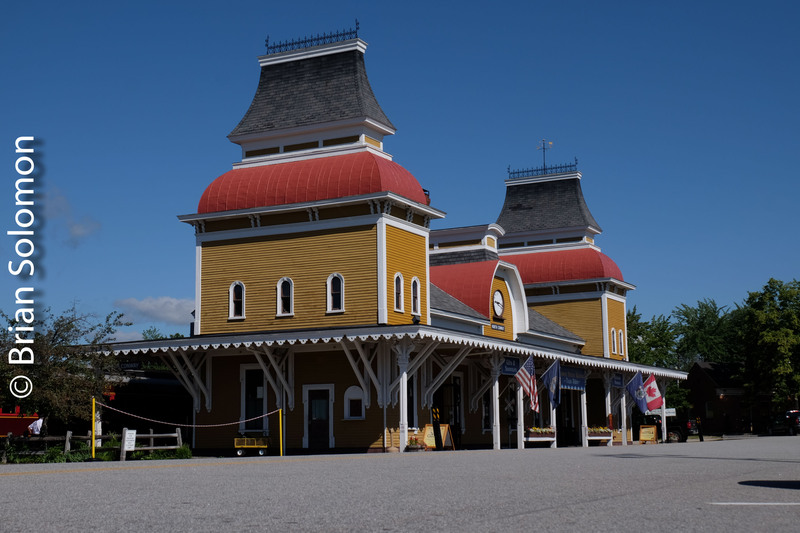 The second picture is of North Conway station, on the Conway Scenic Railway. 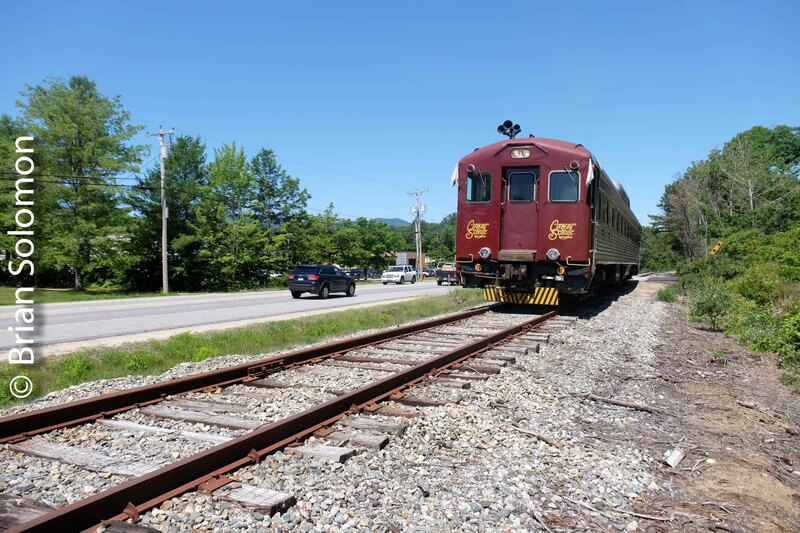 North Conway was near the north end of a lengthy B&M branch from Rochester NH, which connected with the Mountain Division of the Maine Central at Intervale, 7 miles beyond North Conway. The B&M branch and the MC Mountain Division were abandoned by Guilford, but some 50 miles, comprising portions of both lines, survive as the Conway Scenic Railroad. 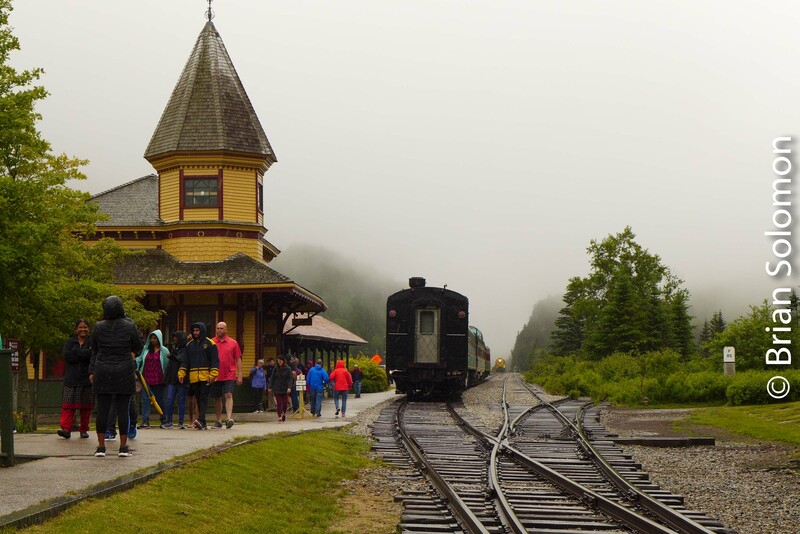 The former Boston & Maine station at North Conway, New Hampshire. 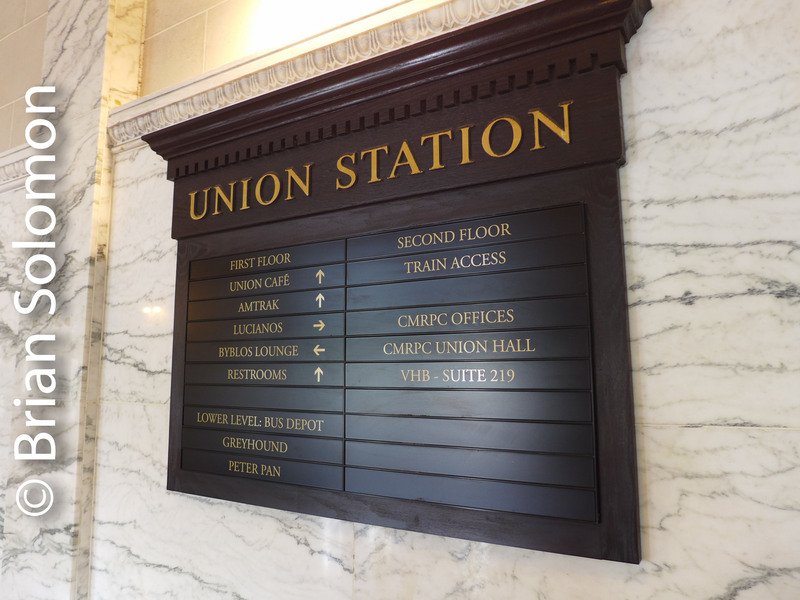 Boston & Maine and Maine Central are primary components of Pan Am Railways. Michael’s answer is spot on: I have just one small correction and a comment; the north end of B&M’s Conway branch (pictured) was sold before Guilford acquired the B&M. I mention this because in each of the three photos, the subject predates their respective company’s role with Pan Am Railways (just to make the puzzle extra tricky). 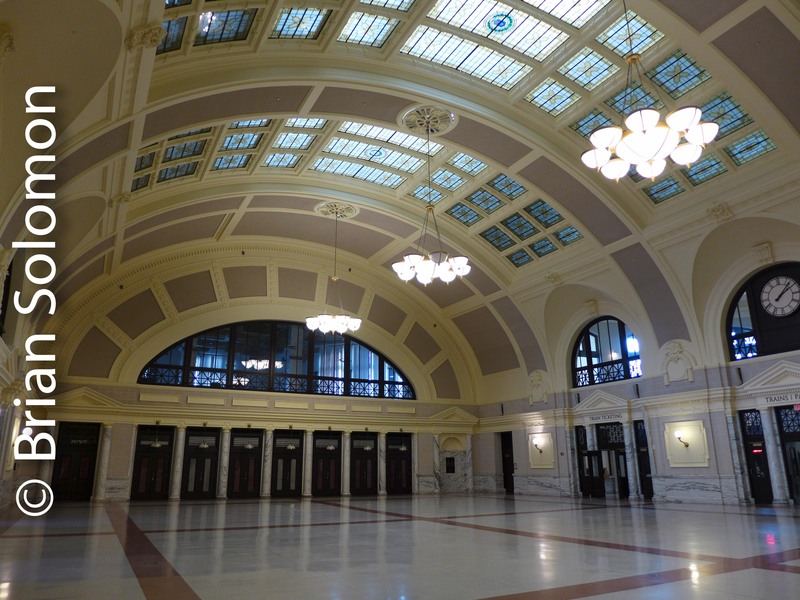 Also, Springfield Terminal has played an important role in operations across the Guilford/Pan Am Railways system. Thanks to everyone who submitted guesses! 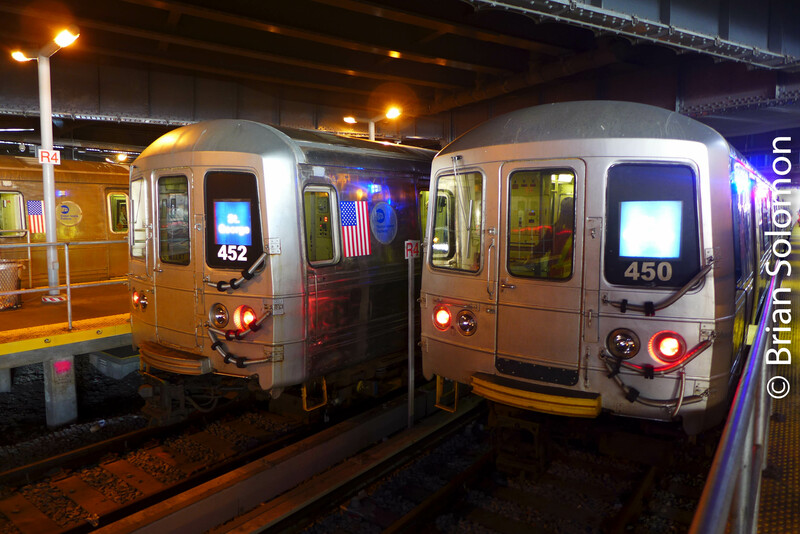 Pan Am Railways has been routinely featured on Tracking the Light over the last six years. Tonight! July 16 2018— Slide Show and Book Signing at the 16 Acres Branch Library in Springfield, Massachusetts. 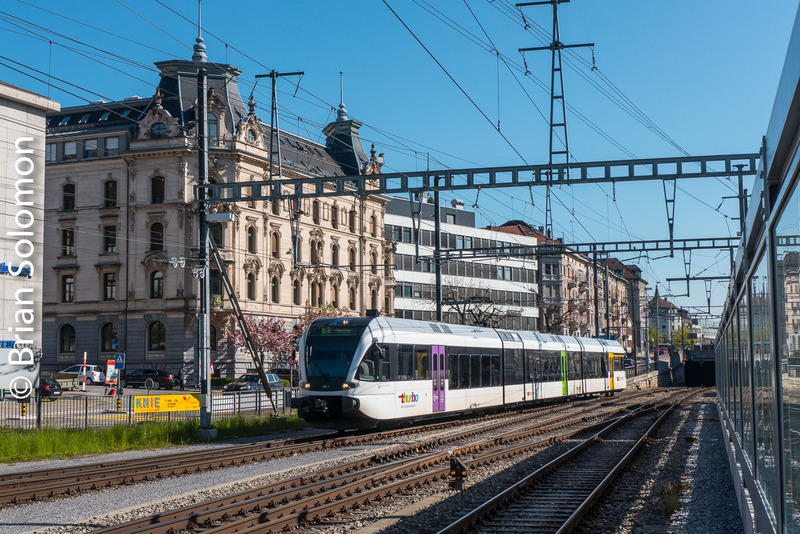 At 615pm on Monday July 16 2018, I’ll be giving a slide presentation on European Railway Travel. This will be immediately followed by a book signing for my new Railway Guide to Europe published this year by Kalmbach Books. The Springfield City Library 16 Acres Branch Library is located at 1187 Parker Street in the 16 Acres area of Springfield. 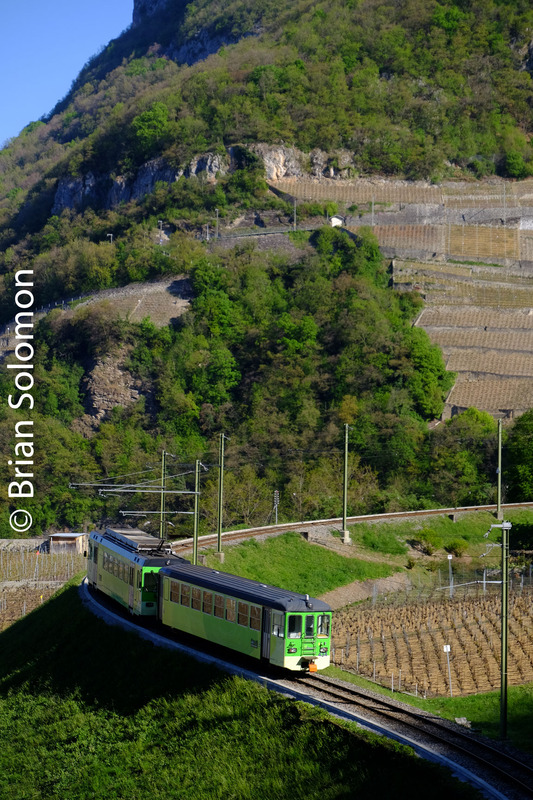 Click here for details on: Brian Solomon’s Railway Guide to Europe. Tomorrow—July 16 2018: Slide Show and Book Signing at Springfield’s 16 Acres Branch Library. 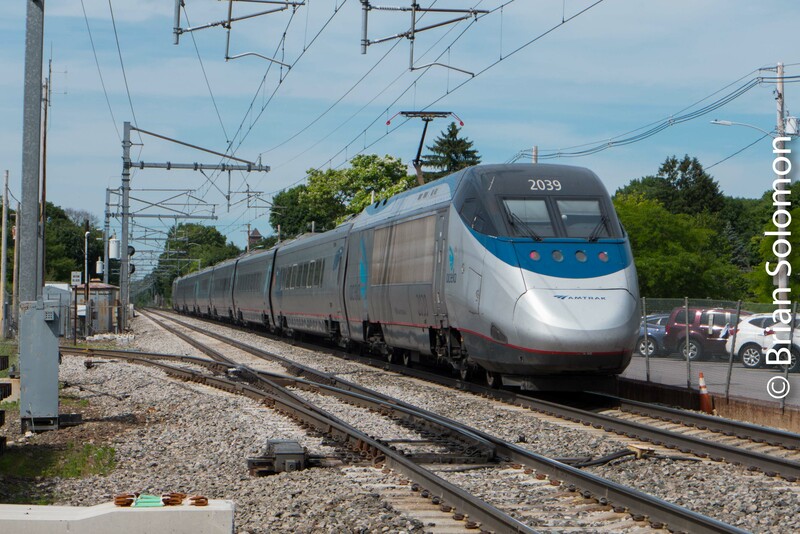 —Springfield, Massachusetts: at 615pm on Monday July 16 2016, I’ll be giving a slide presentation on European Railway Travel followed by a book signing for my new Railway Guide to Europe published this year by Kalmbach Books. This will cover more than 20 years of travel across Europe. 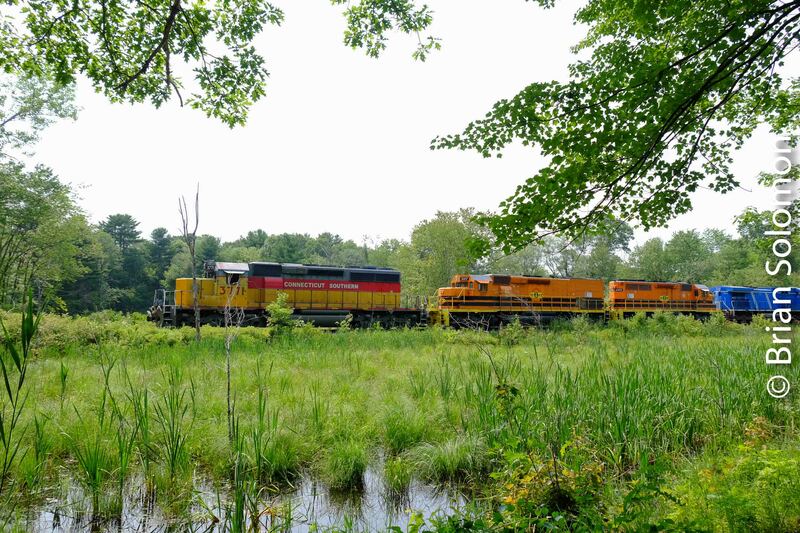 RDC on the Maine Central at Pudding Pond. 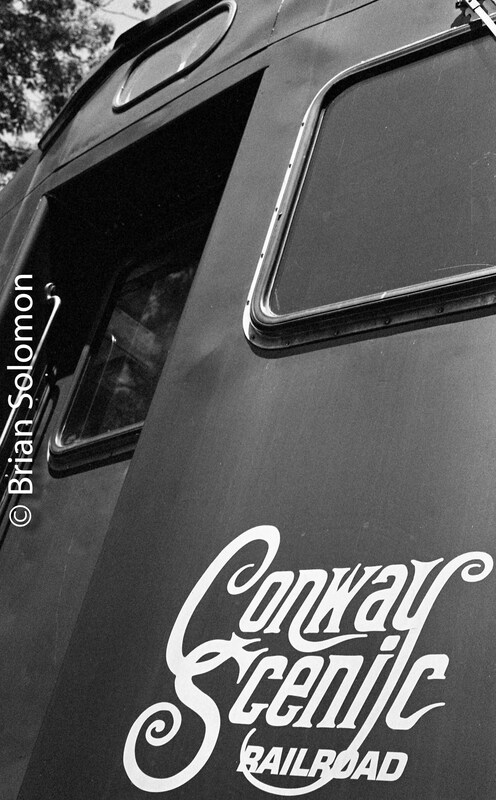 A visit to New Hampshire’s Conway Scenic Railroad a few weeks ago was unusually rewarding. 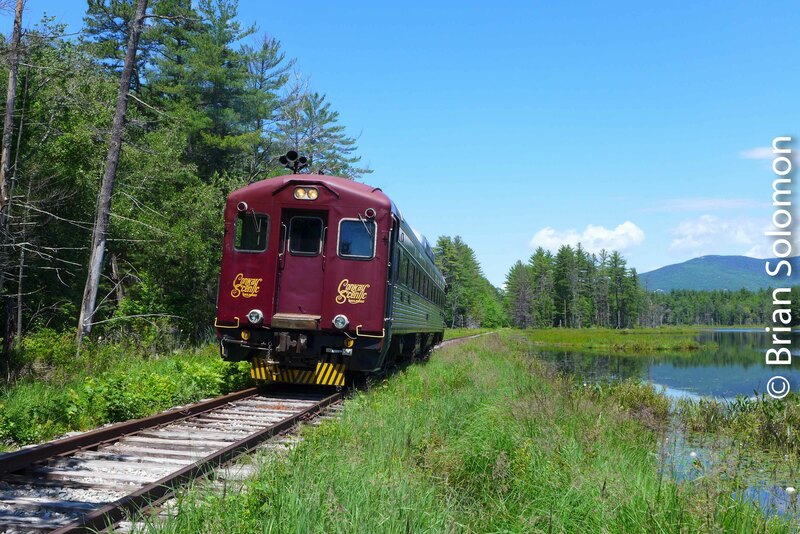 We were invited to travel on a special chartered excursion that worked east on the old Maine Central Mountain Division, a portion of the railroad that only rarely sees trains. It was my first time over that portion of the line. 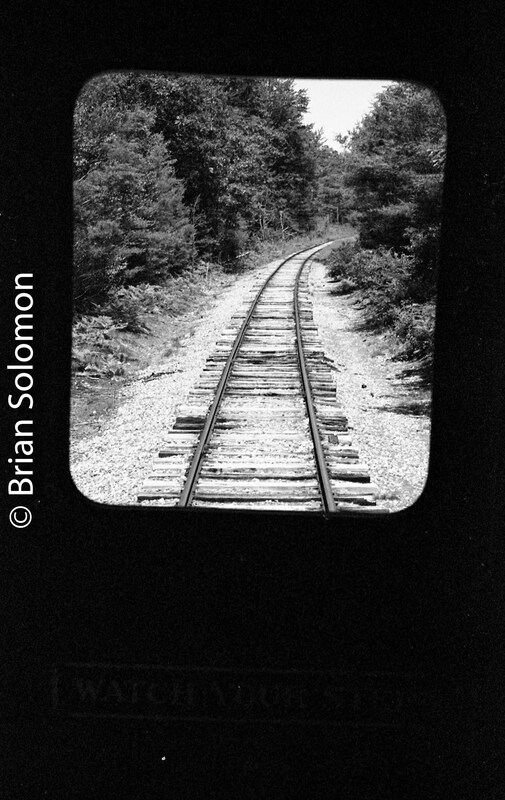 Tri-X view of the old Maine Central. 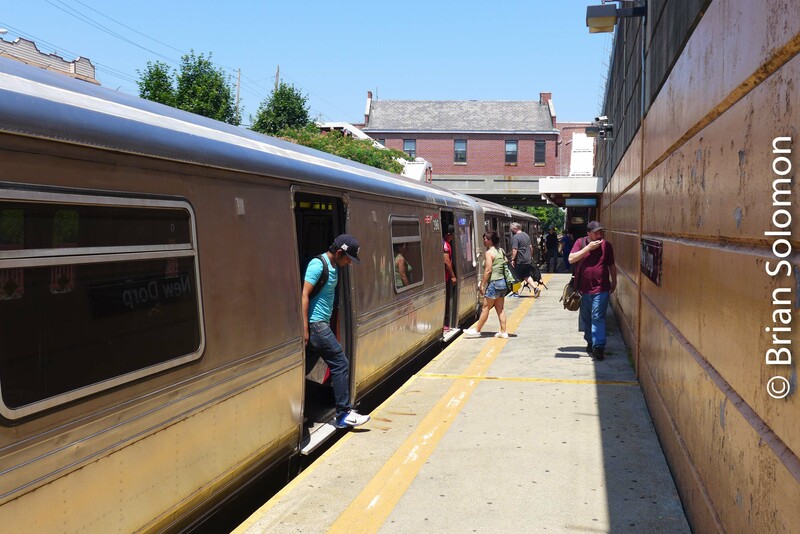 We were treated to a spin on a former New Haven RDC, of the sort that I used to ride in Connecticut many years ago. Exposed on Kodak Tri-X using a 1980s era Nikon F3 with f1.4 50mm lens. I made photos with my Lumix LX7, FujiFilm X-T1, and old Nikon F3 variously loaded with Fuji Provia and Kodak Tri-X. 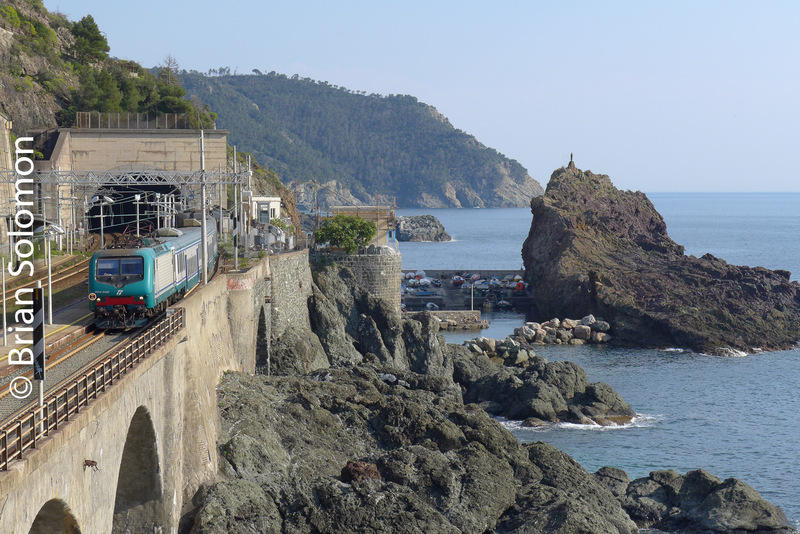 The train crew was very accommodating in regards to photo stops, and suggested some great vantage points. Digital image exposed using my Lumix LX7. 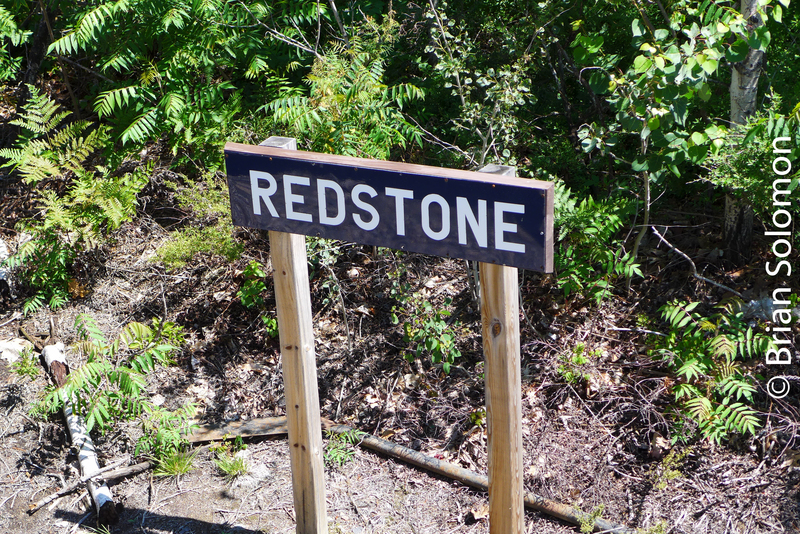 Station sign at Redstone, New Hampshire. Lumix LX7 photo. Exposed using my FujiFilm X-T1 near Redstone, New Hampshire. RDC interior exposed with a Lumix LX7 digital camera. Train crew in silhouette. Kodak Tri-X exposed with a Nikon F3 with 50mm lens. It was a rare day a Pudding Pond. 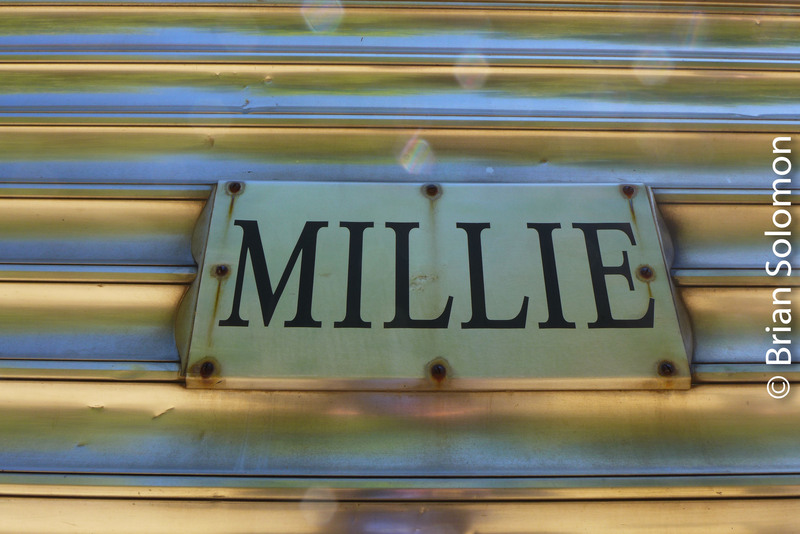 Isn’t East Broad Top number 12 also called ‘Millie?’ Lumix LX7 Photo. 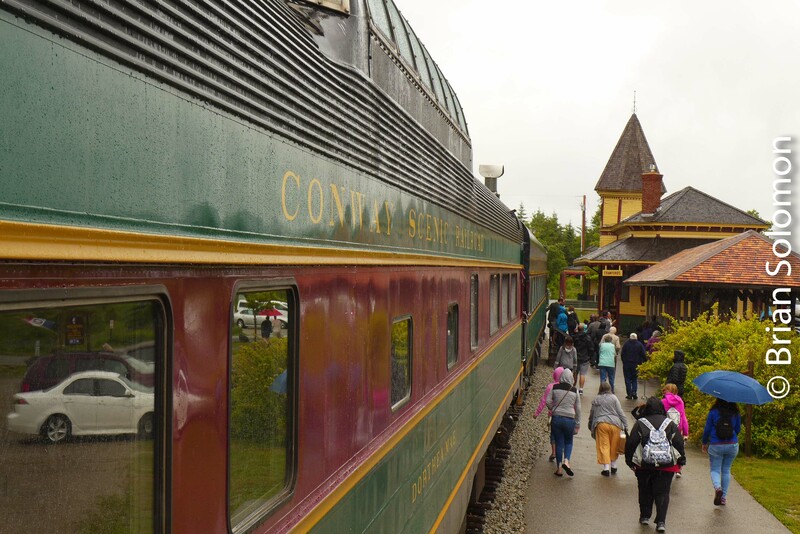 Overall our experience on the Conway Scenic was first class and we had a wonderful time! This is a really great preserved railroad. Thanks to Dave and Rhonda Swirk and all the employees of Conway Scenic! 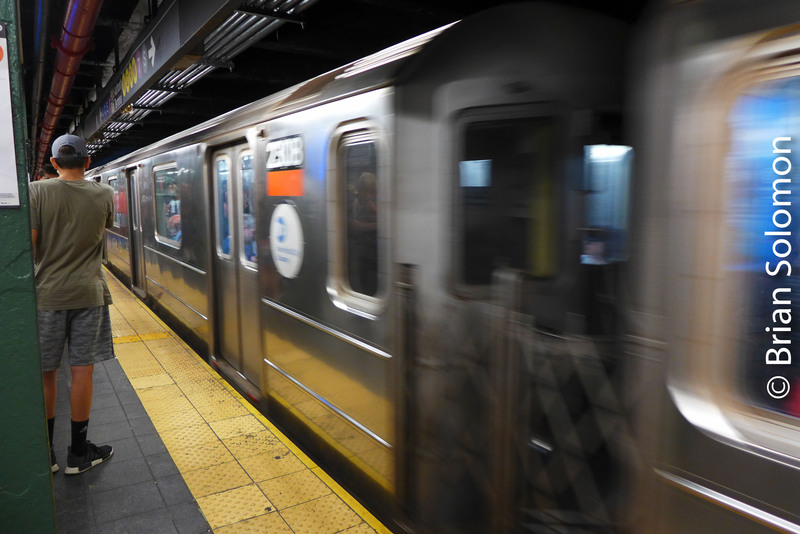 Light Day on the Subway; or Lumix on the IRT. 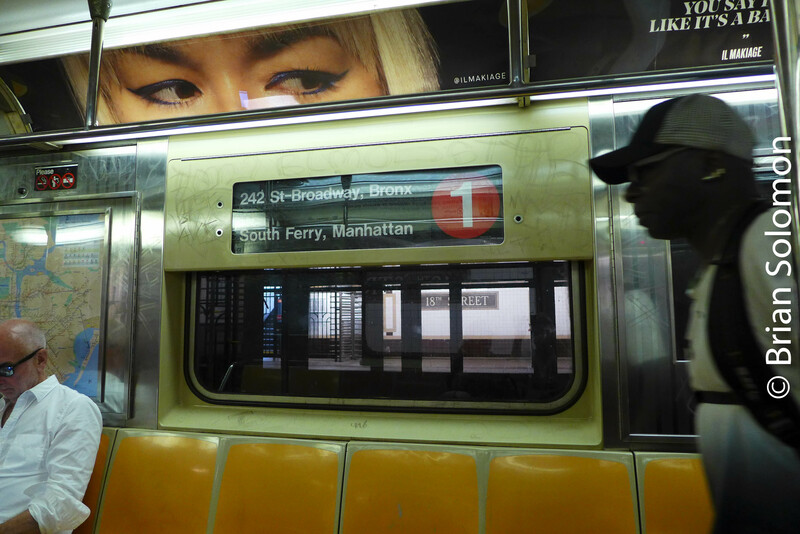 Traveling on the number 1 train, we rode from Times Square to South Ferry on New York City Subway’s old Interborough Rapid Transit. 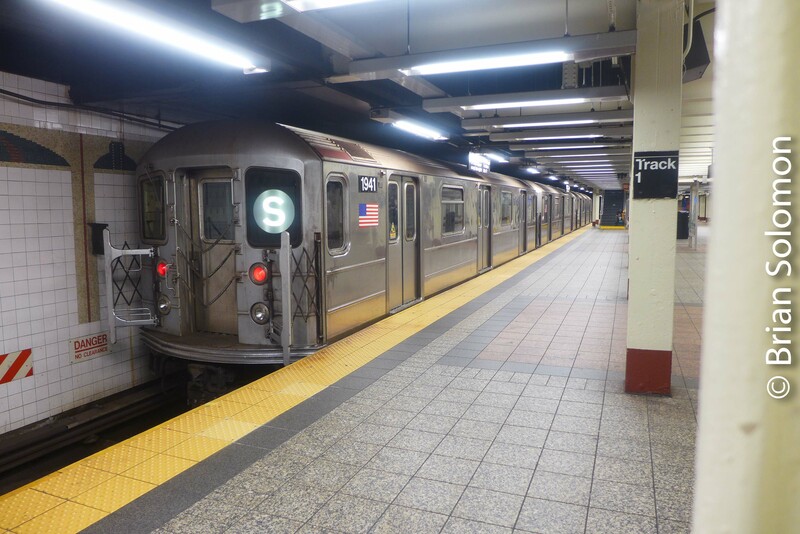 New York was hot that day, but traffic on the subway was light, owing to the 4thof July holiday, and Honer Travers and I had no difficulty finding air-conditioned cars with seats. I made these digital photographs with my Lumix LX7. Lightening the Lake Shore—July 9, 2018. This image was an afterthought. 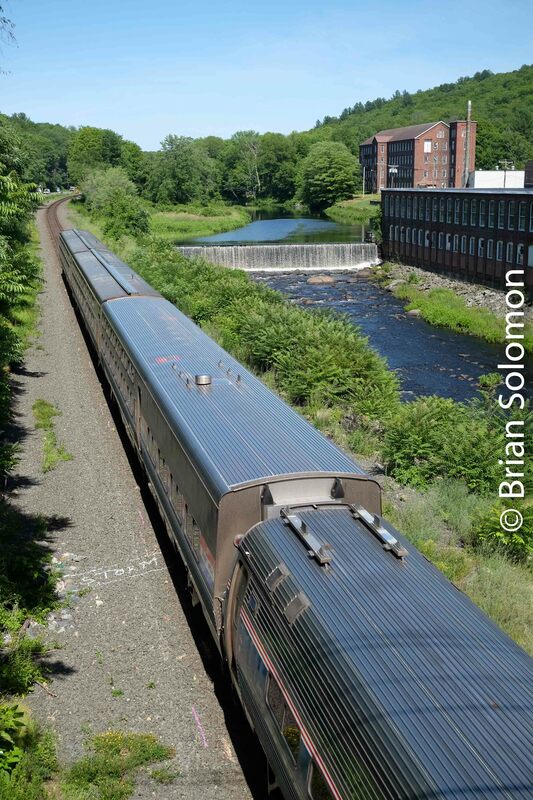 Monday July 9, 2018, my father and I wandered to East Brookfield, Massachusetts to photograph Amtrak’s eastward Lake Shore Limited. 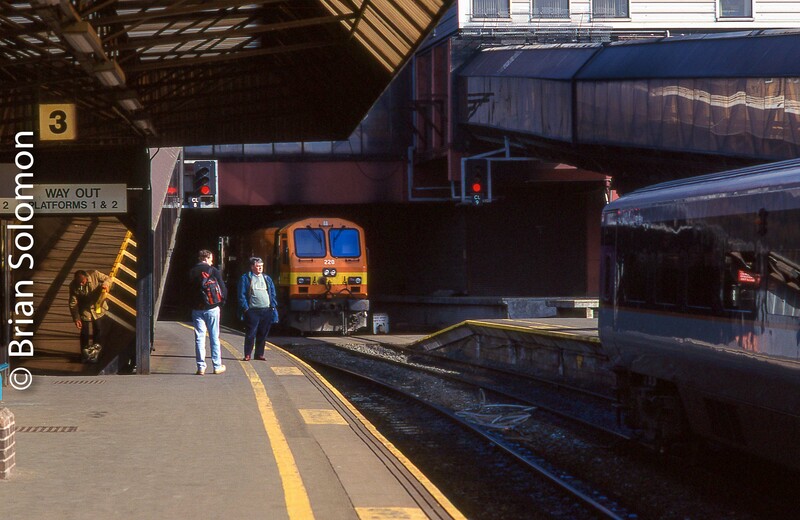 Working on Fujichrome slide film, I first exposed a sequence of photos of the train coming through the switch at CP64 using my old Canon EOS3 with 400mm lens. Those slides remain latent (unprocessed) because I haven’t finished the roll yet. This JPG, scaled from the RAW file, represents the photo as exposed. It is unaltered in terms of exposure, contrast, color temperature, etc. The difficulty is the extreme exposure difference between backlit sun on tracks at CP64 and the inky shadows on the line immediately to the east. Since my exposure was set for the sunlit sections, the shadow areas were underexposed. The alternative was to expose for the shadows and let the highlights blow out (lose data), which would make for a lighter train, but less data captured. In post processing, I worked with the Fuji RAW image, lightening the shadows, while adjusting color temperature and contrast. I’ve presented three images. The darkest photo (above) is a JPG made without adjustment; the lighter two represent variations in post-processing adjustment. If nothing else, these photos demonstrate the great dynamic range possible with the Fuji X-T1 digital camera. Image 2: I’ve lightened and adjusted the RAW file. Image 3: This version was further adjusted in Lightroom to control highlights, shadows and contrast while warming the color temperature to make a more presentable image. Personally, I’m curious to see how my slides turn out! Brian’s Visual Puzzle in THREE photos. Do you knowyour history? You’ll need it to in order to solve this one! But the short answer is more about today than long ago. 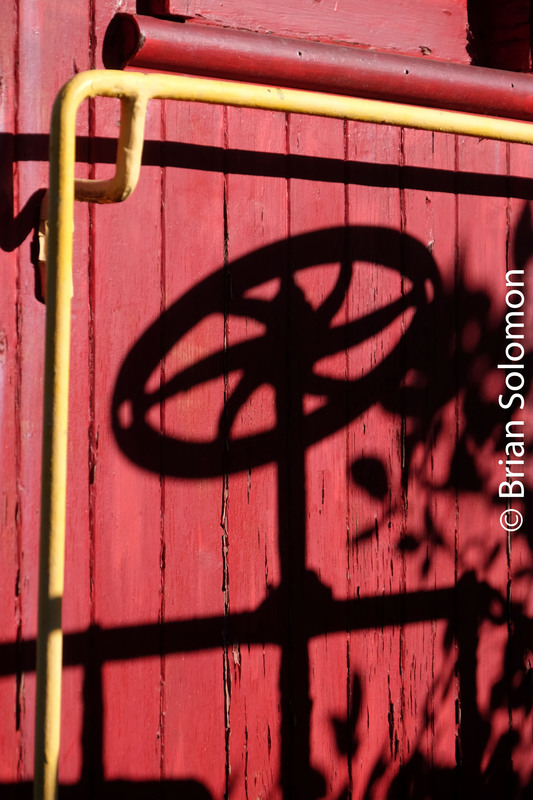 Here are three photographs with a common theme. There’s two levels, but I’ll accept the basic answer as correct. For those of you who really know the history, you can give me the more detailed answer. Think simple: this is not overly complicated, but what isn’t written in two of the photos are keys to the conundrum. And are not overtly relevant to my Irish travels. Also: There’s no relevance to the puzzle regarding dates the photos were exposed, or the lighting, or film versus digital. It’s not about weather or lenses. I exposed all photographs at different times on different days, but don’t be watching clocks. The correct answer has a lot to do with something that doesn’t appear in ANY of the three photos, but is often featured on Tracking the Light. Post your ‘correct’ answers in the Tracking the Light comments, on Facebook, via email, etc. I’ll reveal my solution(s) in a few days. Amtrak, Nose Glint, Sleepers, and a Waterfall. 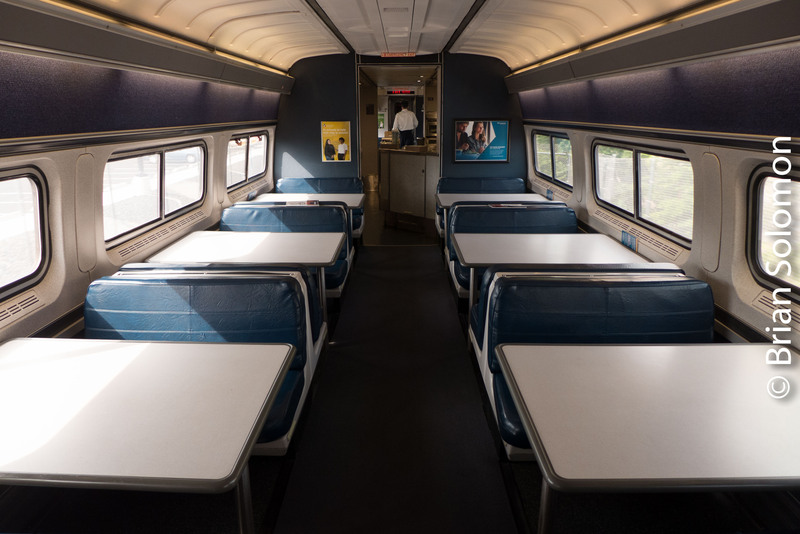 This summer Amtrak 448/449, the Boston section of the Lake Shore Limited, is the onlysection of the Lake Shore Limited! 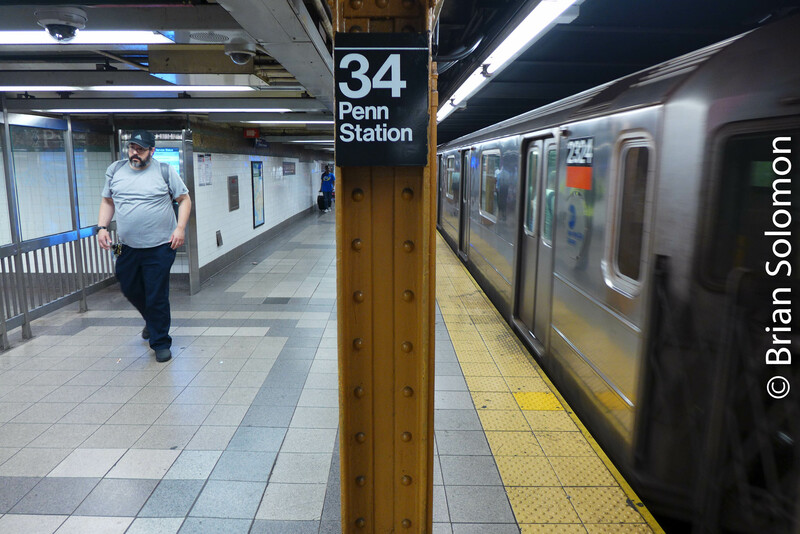 Construction at Penn-Station New York has encouraged Amtrak to cancel the New York section of this popular train, and reassign its Viewliner sleeps to the Boston section. A clear afternoon had me searching for locations. 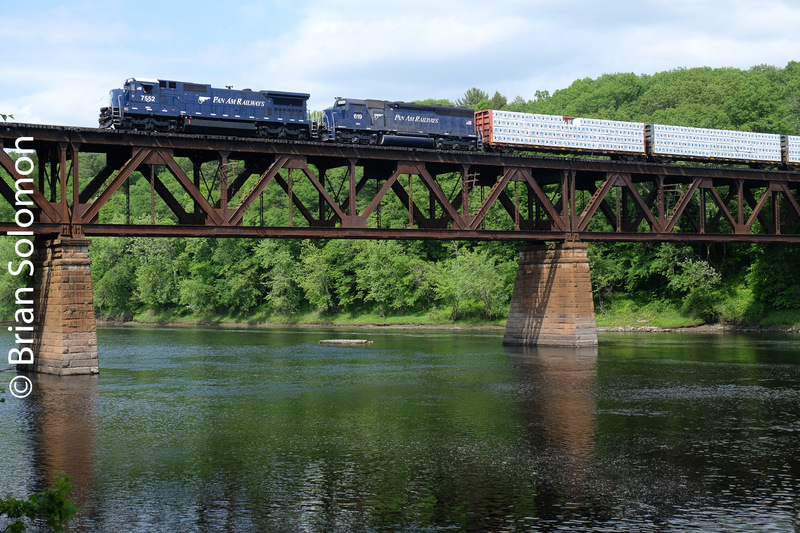 My first choice was the Tennyville Bridge in Palmer (Rt 32 bridge), but a large quantity of freight cars in Palmer yard discouraged me. My next choice was the field east of Palmer off Rt 67, but I vetoed this place because of excessive brush. Brush and trees are real problem this time of year along the old Boston & Albany. Not only do the obstruct views of the tracks, but they cast impenetrable dark shadows. So, I ended up at my standard fall back location at West Warren. 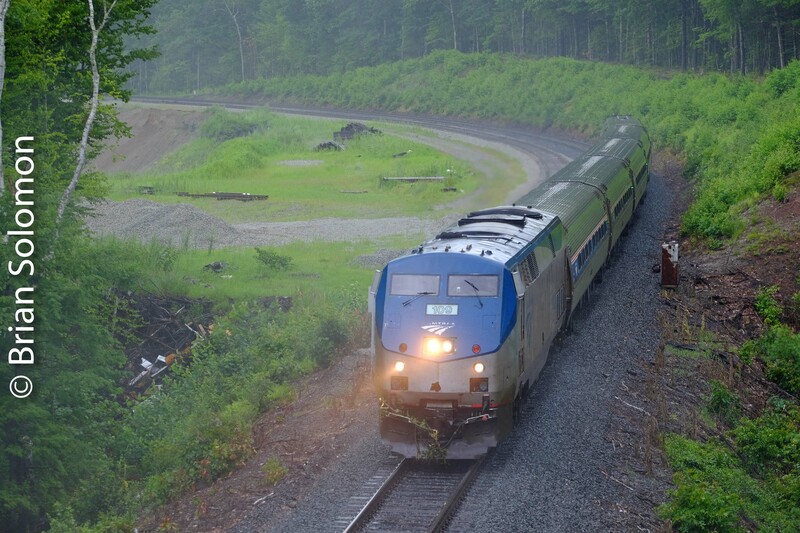 Although, I’ve photographed Amtrak 449 here dozens of times, it had several advantages. It’s a relatively short drive; it has elevation and an unobstructed view of the line from both sides of the tracks; its east-west orientation makes for nice early afternoon lighting; and the waterfall and mills make for an iconic and readily identifiable backdrop. So, West Warren it was. Again. I made this sequence with my FujiFilm X-T1 with 27mm pancake lens. 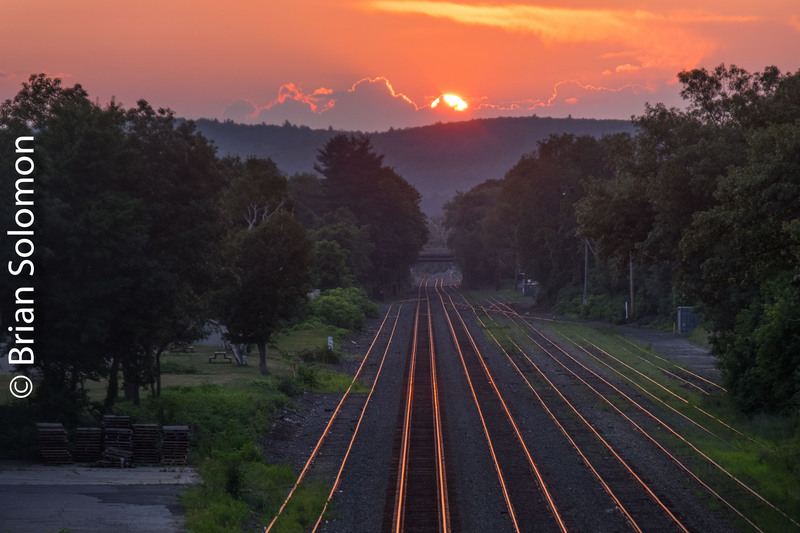 West Warren, Massachusetts is an iconic location on the old Boston & Albany. 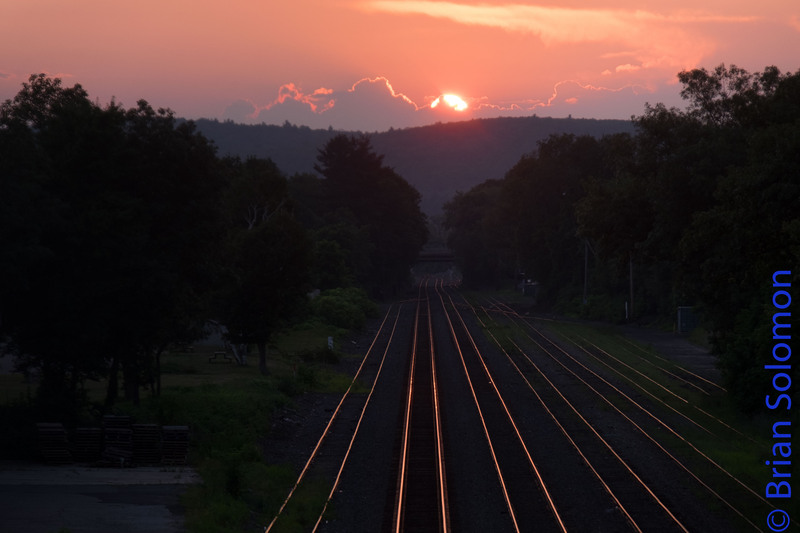 By the time Amtrak train 449 reached me, the sun had crossed over to the northside of the tracks. 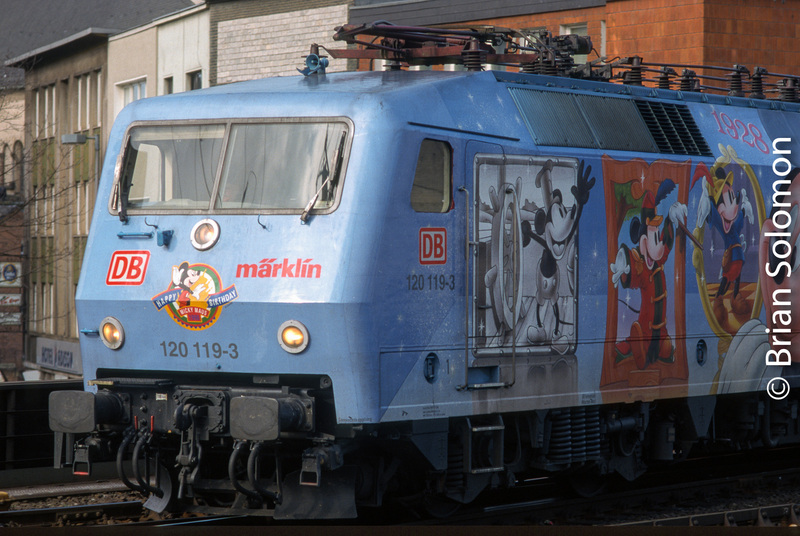 Notice the unfortunate nose-glint’ reflecting off the front of the engine. I tempered this in post processing with an adjustment to the highlight-level. 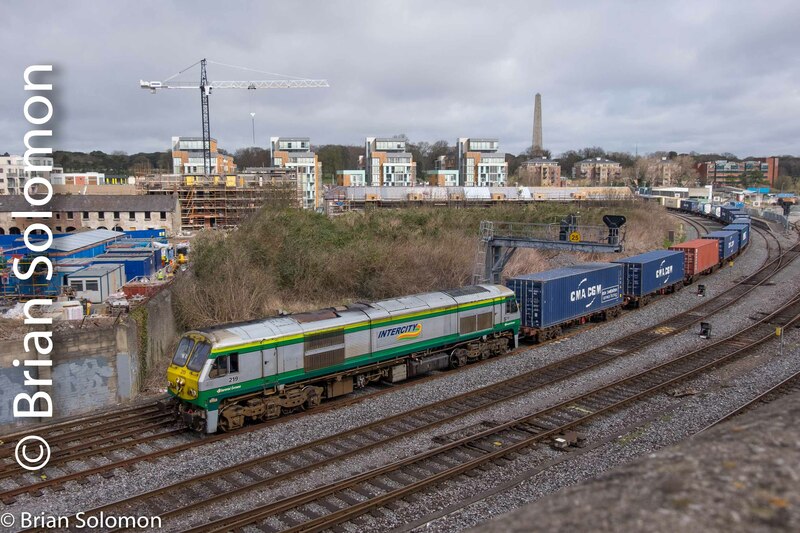 Here’s the three Viewliner sleepers at the back of the train. 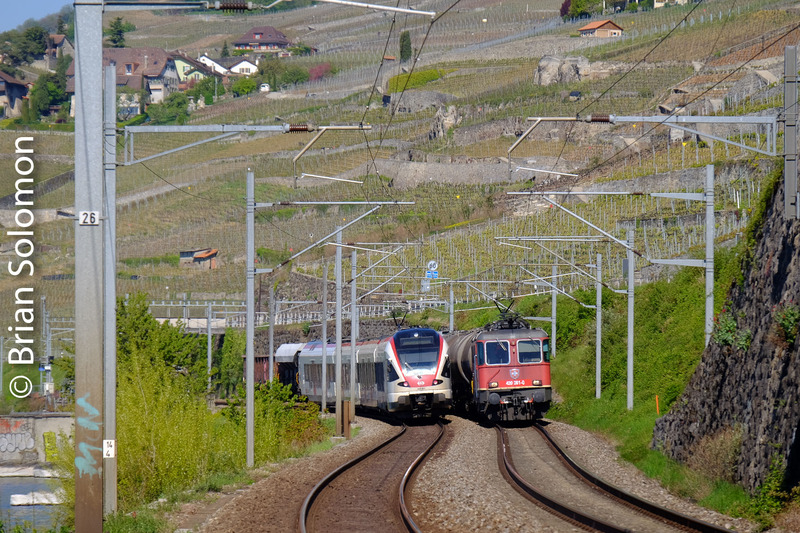 Two difficulties; the nosy angle of the sun made it difficult to get an acceptable broad side angle on the train, so the three sleepers at the back are visually marginalized. 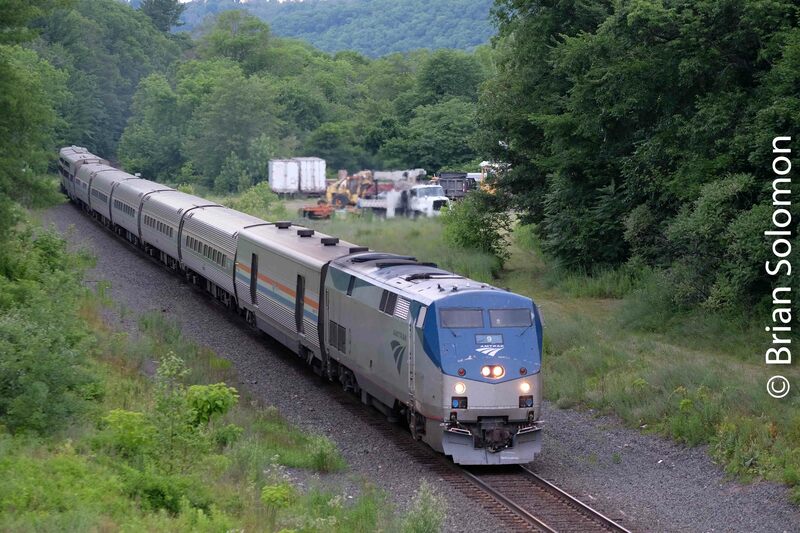 Secondly, the wedge angle of the Amtrak P42 front-end kicked back the sun with harsh ‘nose glint’. 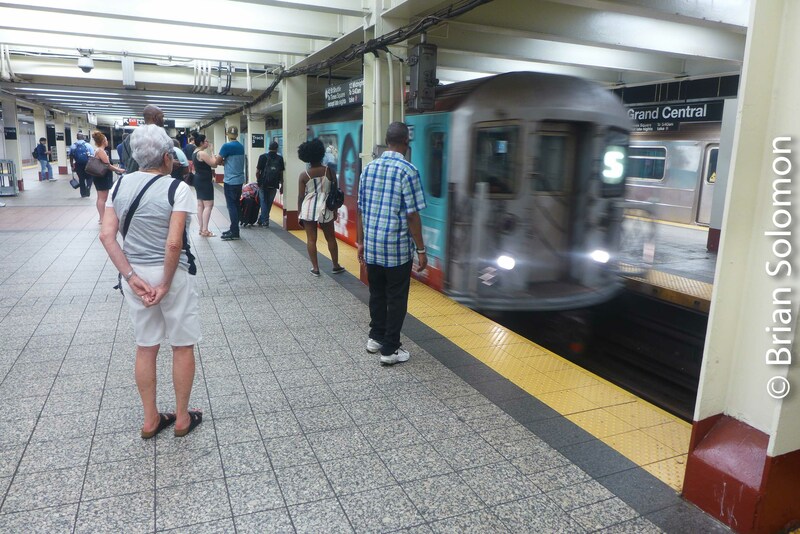 Grand Central—Times Square Shuttle revisited in Four Photos. 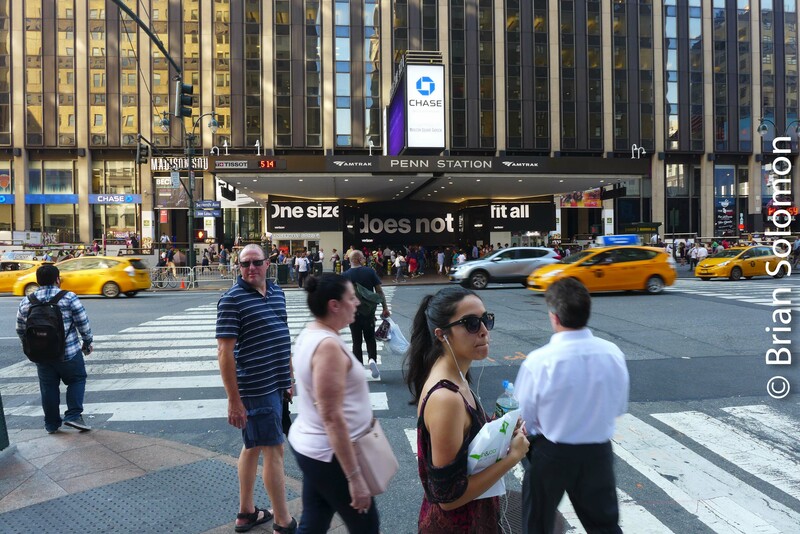 A short, curious, and heavily traveled part of the New York City subway system, is the two-stop Grand Central—Times Square Shuttle that runs solely between its namesake points. Last week, Honer Travers and I made the journey on this relic. 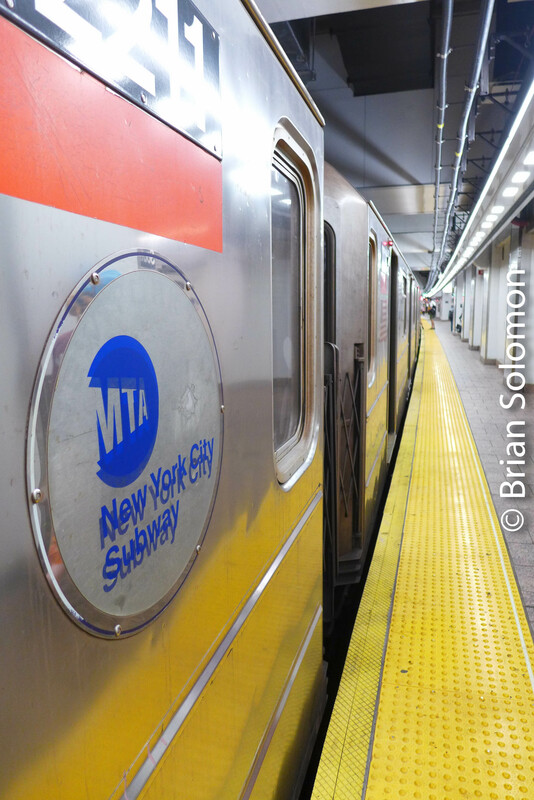 Historically, two of my big challenges for color subway photography were exposure and color balance/color temperature. 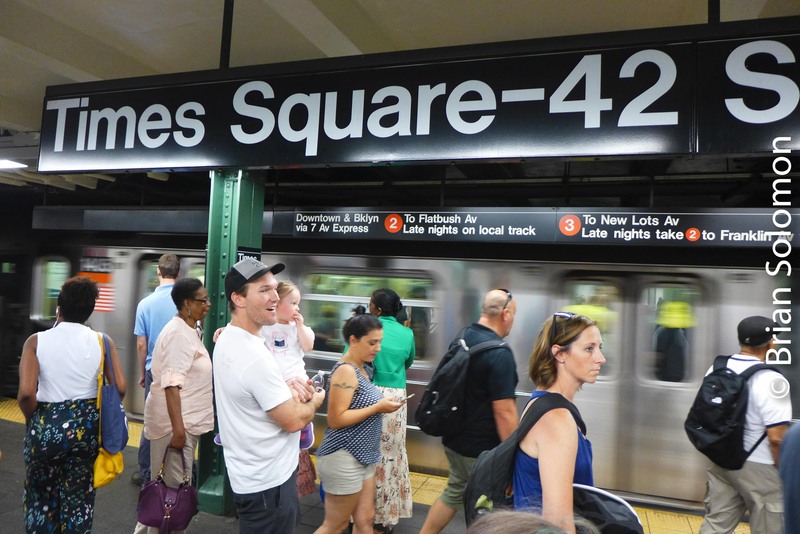 Today, the Grand Central—Times Square Shuttle stations are brightly lit. I set my Lumix LX7 color temperature control to ‘auto white balance,’ which obviates most unwanted color temperature spikes caused by artificial light. Other than scaling for internet presentation, I didn’t modify these images post processing for color temperature/color balance, contrast or exposure. Lumix LX7 photo: f1.6 1/30th second. Lumix LX7 photo: f1.6 1/20th second. Train 157 is Amtrak’s Sunday-only Springfield, Massachusetts to Norfolk, Virginia run. 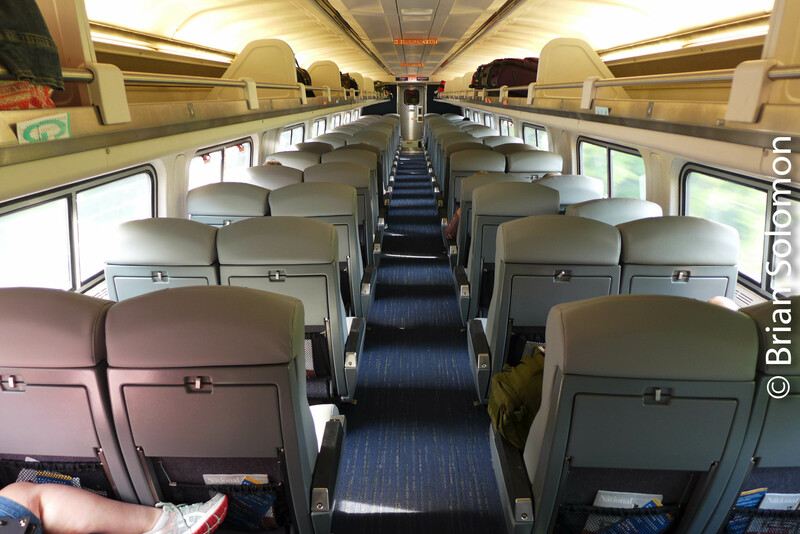 Refurbished Amfleet offer a comfortable classic ride. 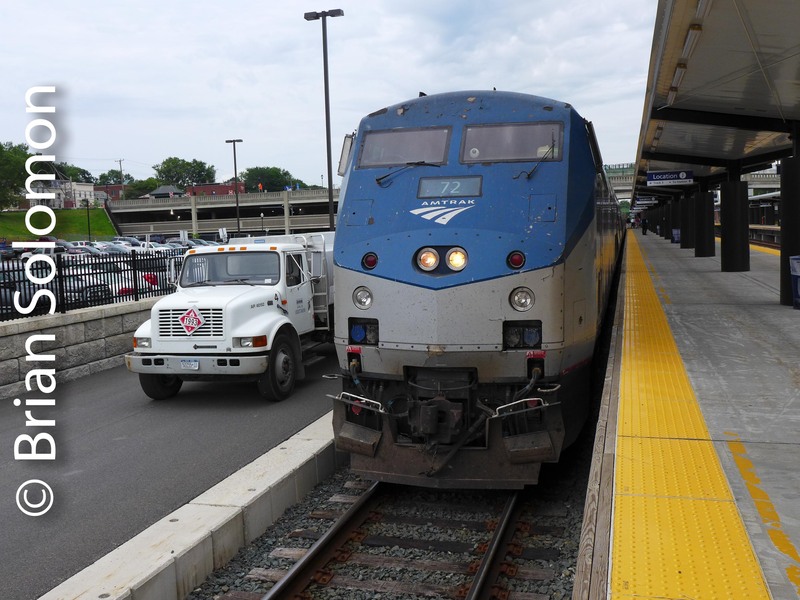 At New Haven, Amtrak 157 paused to change from a diesel to an electric locomotive. I used the opportunity to make a few photos. 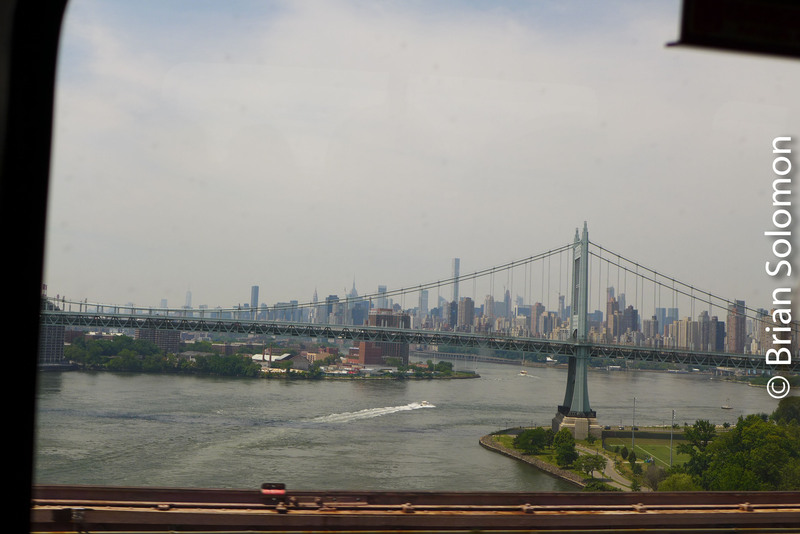 The New York skyline as viewed from the Hell Gate bridge. 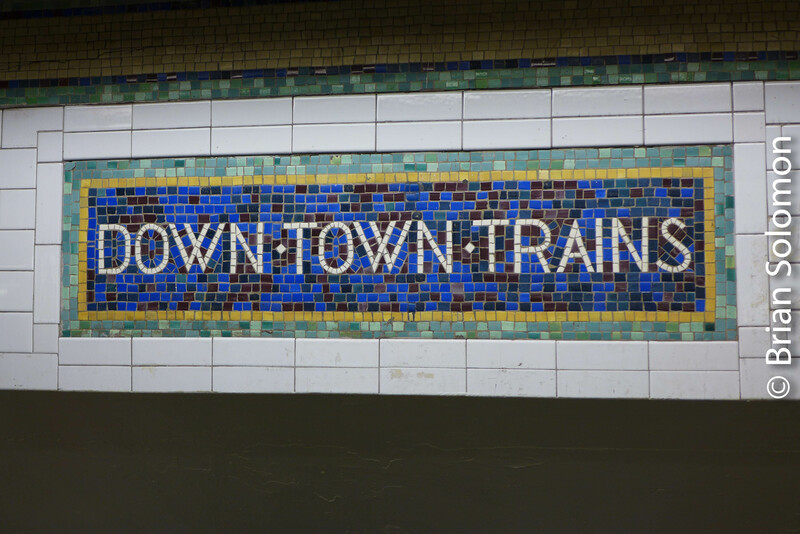 On my trip,I traveled only as far as New York Penn-Station and made these photos with my Lumix LX-7. Here the train is both transport and subject. The lightweight Lumix is an ideal camera for urban imaging. Its small size, innocuous appearance and ease of use makes it a perfect travel camera. It has an extremely sharp Leica lens, simultaneously exposes RAW and JPG file formats, offers manual aperture control among a variety of exposure adjustments. It’s largest drawback is the lack of a long telephoto zoom. Slide Show and Book Signing July 16, 2018 at the 16 Acres Branch Library in Springfield, Massachusetts. 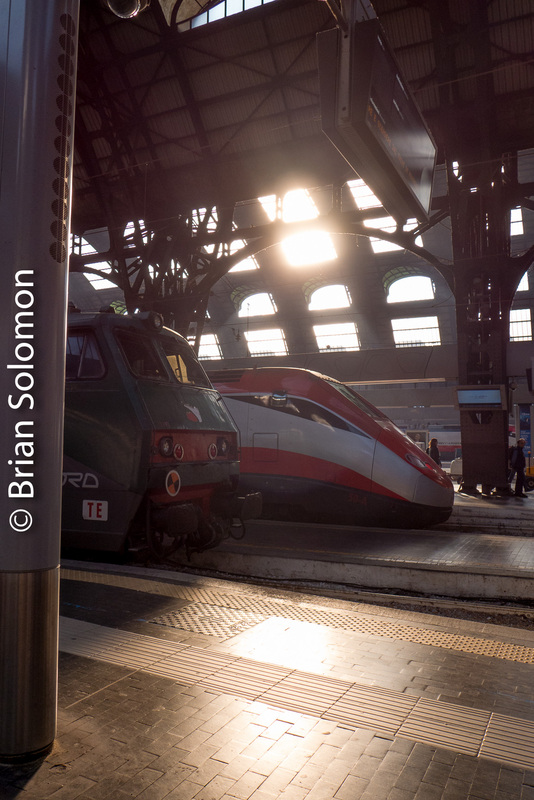 Join Brian Solomon at 615pm on Monday July 16, 2018 for a slide presentation on European Railway Travel followed by a book signing for my new Railway Guide to Europe (published this year by Kalmbach Books). This will be a real slide show with authentic 35mm color slides (in contrast with projected digital slide) that picture more than 20 years of travel across Europe. The Springfield City Library 16 Acres Branch Library is located at 1187 Parker Street in the 16 Acres area of Springfield, Massachusetts. 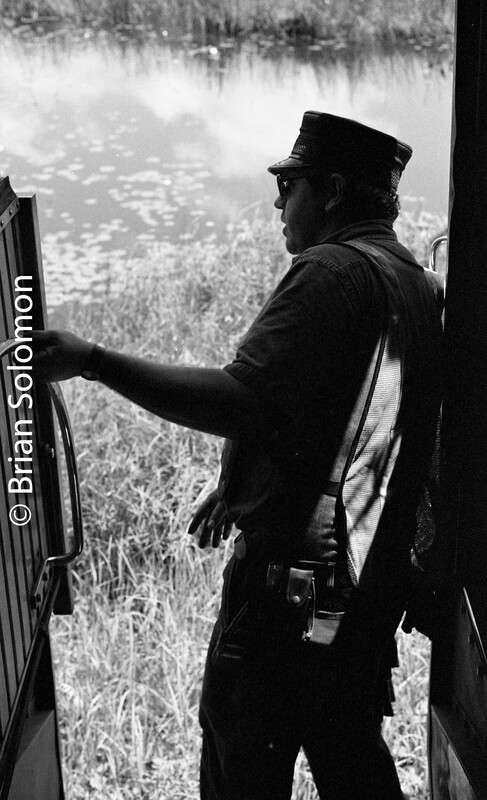 Brian Solomon Slide Show and Book Signing July 16, 2018—16 Acres Branch Library, Springfield, Massachusetts. 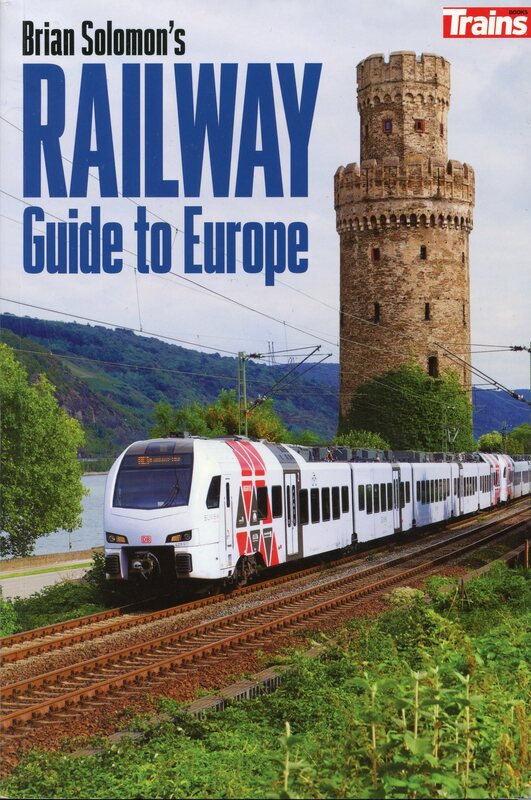 At 615pm on Monday July 16, 2018, I’ll be giving a slide presentation on European Railway Travel followed by a book signing for my new Railway Guide to Europe (published this year by Kalmbach Books). This will be a real slide show with real 35mm color slides picturing more than 20 years of travel across Europe. 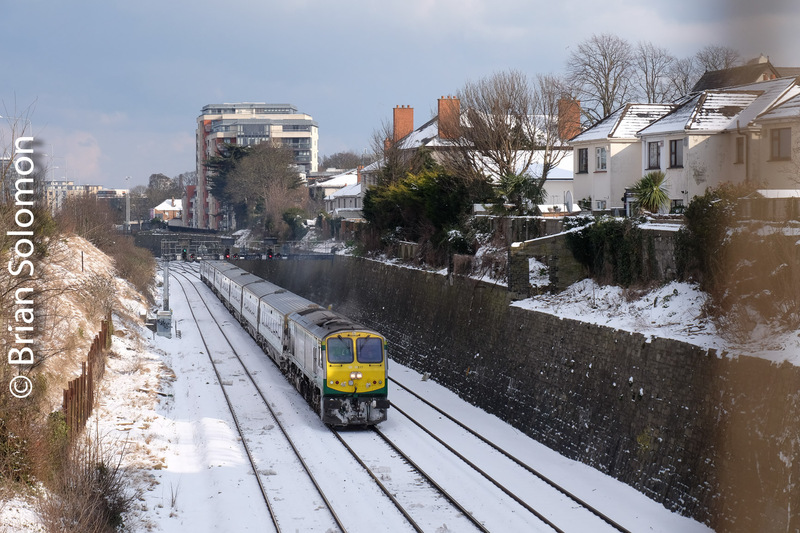 Irish Rail 217—Three Photos: Summer, Fall & Winter. 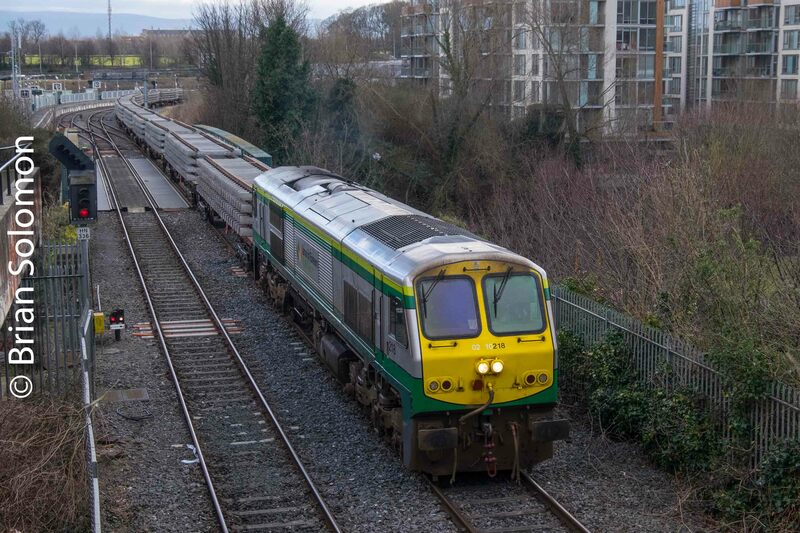 Next up in my 20 year retrospective featuring the Irish Rail 201 class is Irish Rail locomotive 217! Is this anyone’s favorite engine? I have many images of 217 over the years, and I’ve selected these three for presentation here. Details in the photos below. 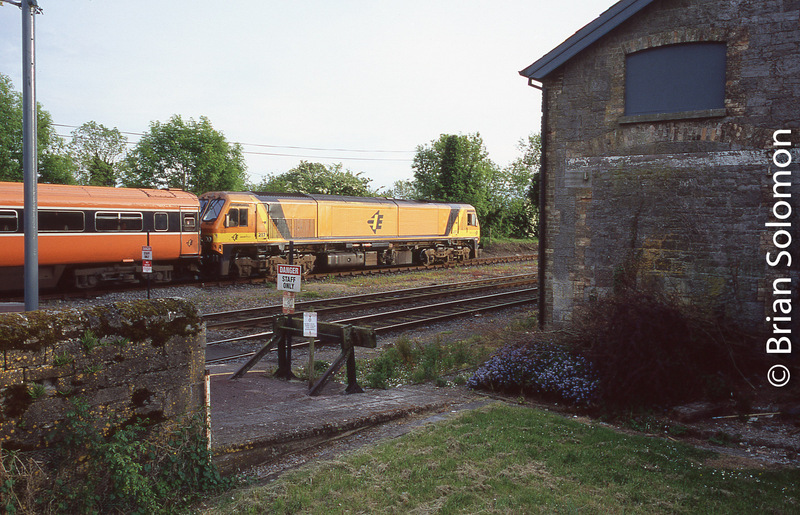 Irish Rail 217 pauses in the loop at Ballybrophy in June 2006. Exposed on Fujichrome using a Contax G2 rangefinder with 28mm Zeiss Biogon lens. 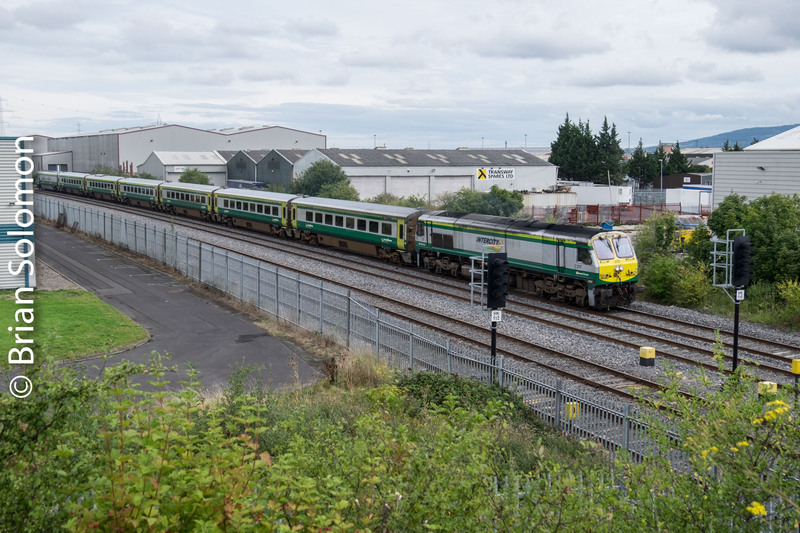 September 2016, 217 passes Clondalkin on the quad track in suburban Dublin with the down Mark4 for Kent Station Cork. FujiFilm X-T1 digital camera. Rare snow blankets Dublin on 28 February 2018. FujiFilm X-T1 photo. I made this photo through the fence at Memorial Road, you can see part of the fence blurred at right. Normally I’d crop this defect, but I left it in so you can see the challenge of photographing at this location. Careful positioning will allow for an unobstructed view, but I wasn’t as careful as I should have been. 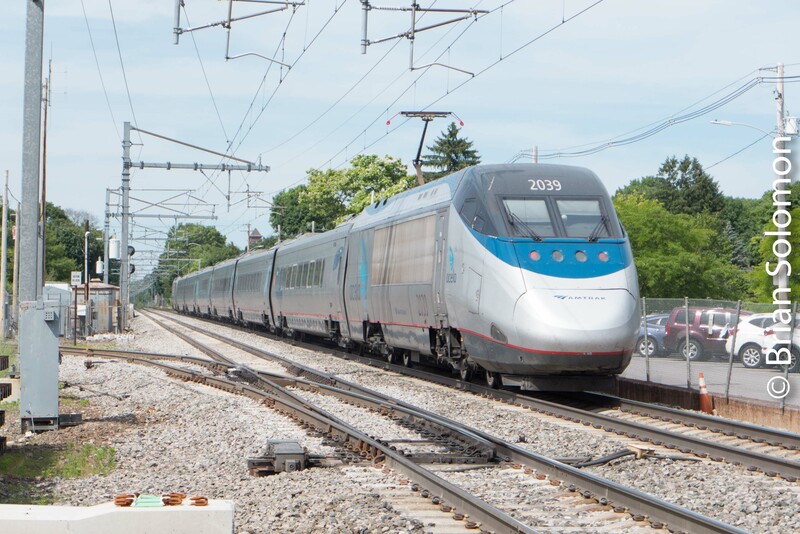 My goal was to stop Amtrak’s Acela Expressat speed. I wanted to use the fastest shutter speed, so I dialed in a wide aperture on my Lumix LX-7. However, I was using the aperture priority ‘A’ setting, and when I ‘opened up’, I inadvertently overexposed, because the maximum shutter speed possibly on this camera is 1/2000thof a second, and the correct shutter speed/f-stop combination for my wide aperture was probably closer to 1/4000thof a second. The result is an overexposed digital RAW file. That means I let in toomuch light. Not only is the tonality too bright, but I’ve suffered data loss in the highlight areas. This is a Jpg made from the unadjusted RAW file. In other words I’ve not made an effort to correct for over exposure. Working with the RAW file in Lightroom, I was able to adjust my exposure, and recover some of the highlight detail lost in the in-camera Jpg. The result is pretty good. Working in Lightroom, I’ve adjust the RAW file to compensate for over exposure, and made the image appear more-or-less as it did at the time of exposure. So why bother getting the exposure right if you can adjust the photo after the fact? Ideally, when a photo is exposed properly the RAW file should capture the maximum amount of information. When a photo, such as this one, is overexposed it suffers from data loss. Although the correction looks presentable, the bottom line is that the file has less data than if it had been correctly exposed. So while you can ‘fix it’ after the fact, it pays to get right on site—when you can. MBTA HSP-46s Not So New Now. 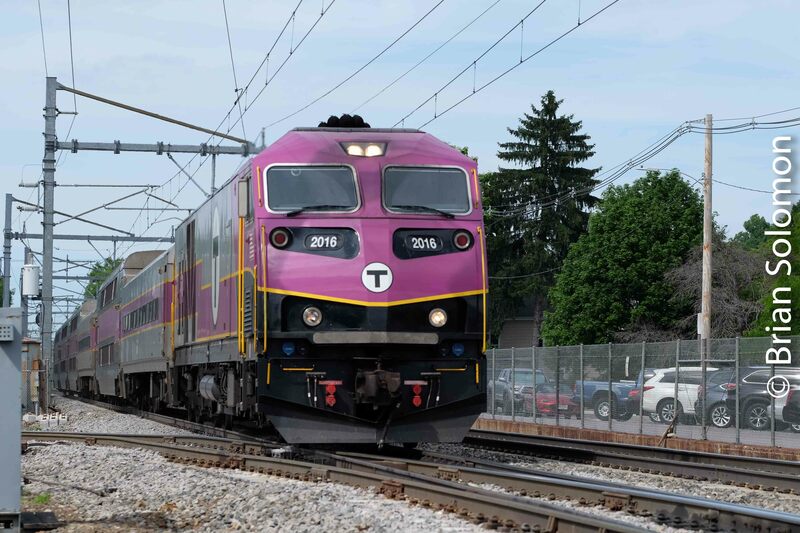 I still think of MBTA’s HSP-46 diesel-electrics a brand new locomotives. In fact, these have been on the roll since 2014. Would you think of a four-year old car as being ‘new’? 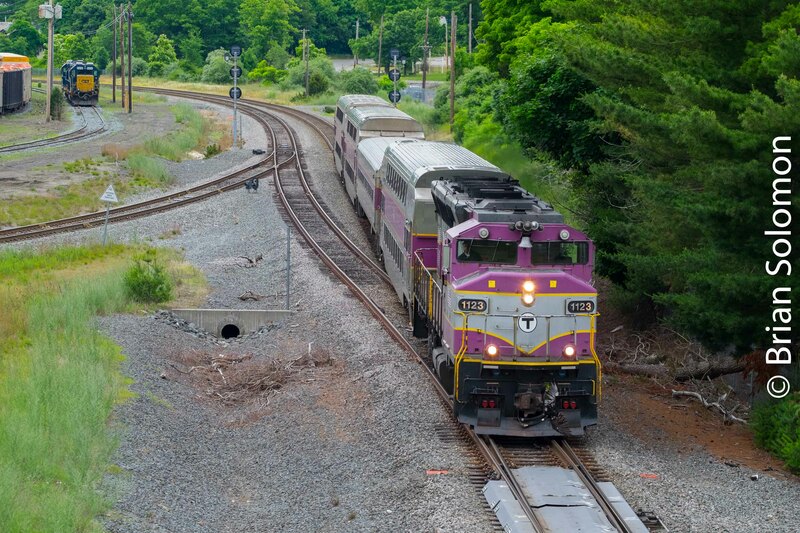 The HSP-46s are certainly newerthan MBTA’s other locomotives. 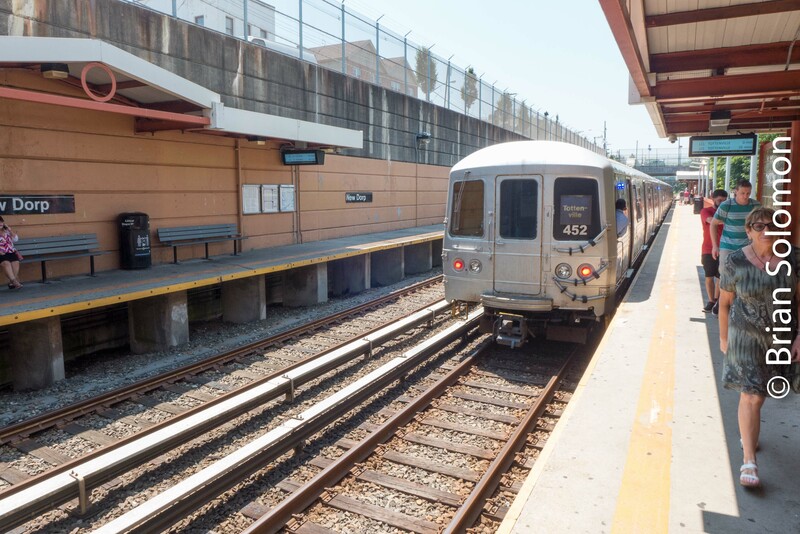 Built by Wabtec’s MotivePower Industries with General Electric components, these distinctive looking machines are unique to MBTA. FujiFilm X-T1 with 90mm telephoto lens. 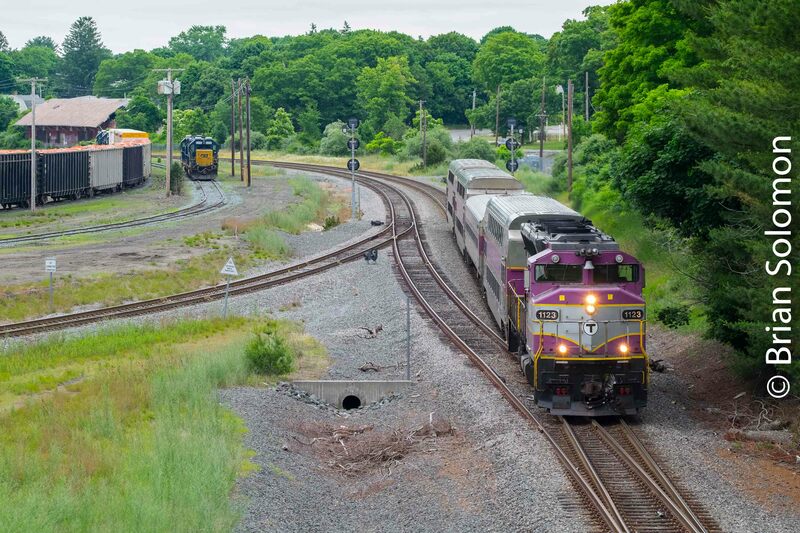 In late June, I exposed this view of MBTA 2016 leading southbound train 817 as it approached its station stop at Mansfield, Massachusetts.